“As a tradition in the Gooding home, mouth-blown glass canisters from Juliska’s ‘Isabella’ collection hold holiday wishes from each member of the family. The calligraphy is by Pier Gustafson (piergustafson.com).” Photo: John Bessler. “Gorgeous Intergenerational Holiday Gathering” written by Krissa Rossbund. Traditional Home. Janet Brown Interiors is your Richmond source for Juliska. “Graceful champagne flutes stand ready for holiday toasts.” Chelsea apartment of Manhattan designer Christopher Hyland. 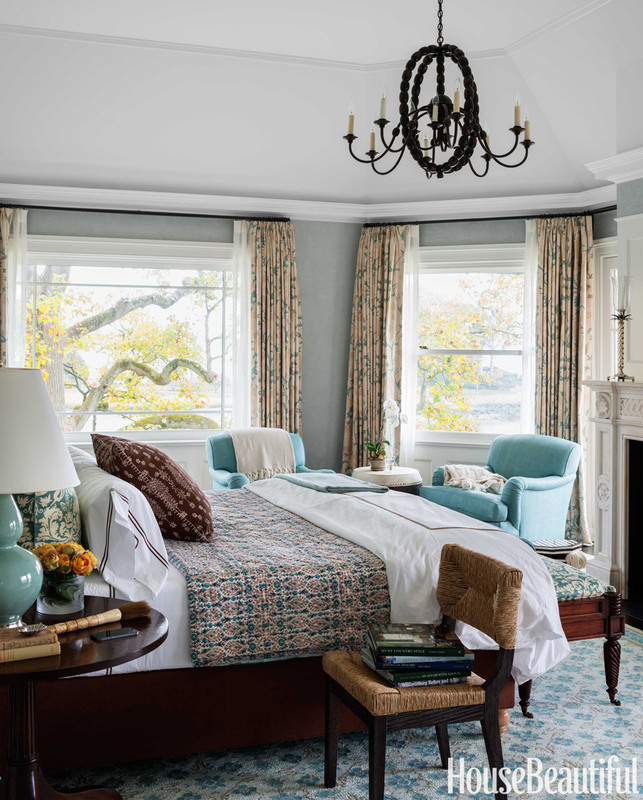 Interior design by Christopher Hyland, Christopher Hyland Inc. Photography by John Bessler. Text by Amy Elbert. “Visions of Sugarplums” produced by Ann McVicker. Traditional Home. In many Spanish-speaking countries, New Year’s Eve celebrants try to eat a dozen grapes quickly as the clock chimes midnight to ensure good luck and prosperity in the new year. If you want to add this tradition to your New Year’s festivities, consider serving skewers of grapes in pretty champagne flutes. “In many Spanish speaking countries party-goers quickly eat a dozen grapes (uvas) as the clock strikes midnight for good luck and prosperity! 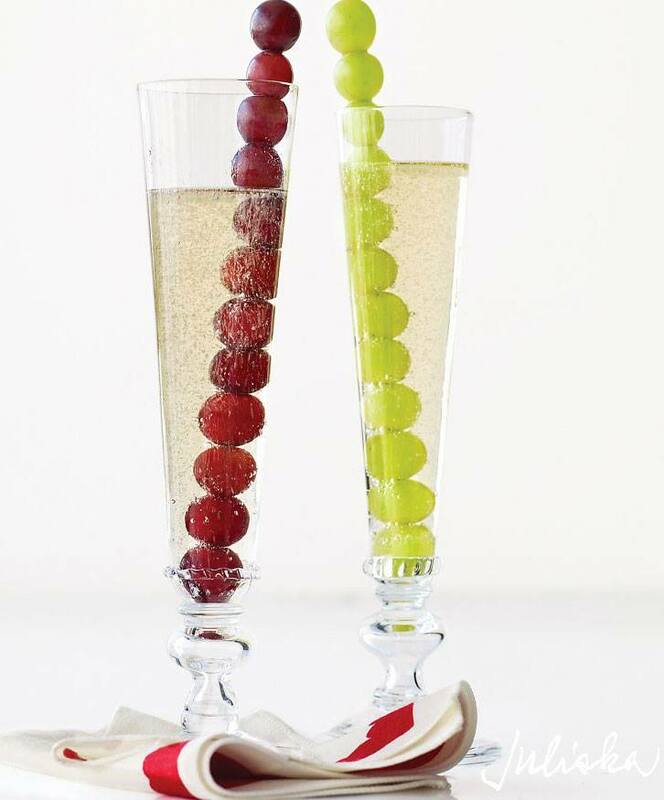 Make this tradition your own by stringing grapes on skewers and serving with a glass of champagne in your favorite Juliska flute!” Photo via Juliska’s Facebook timeline. Janet Brown Interiors is your Richmond source for Juliska. 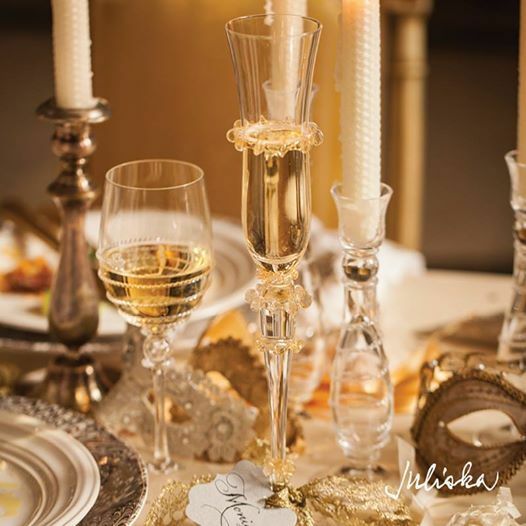 Juliska’s champagne flutes are perfect for chocolate or bubbly drinks! 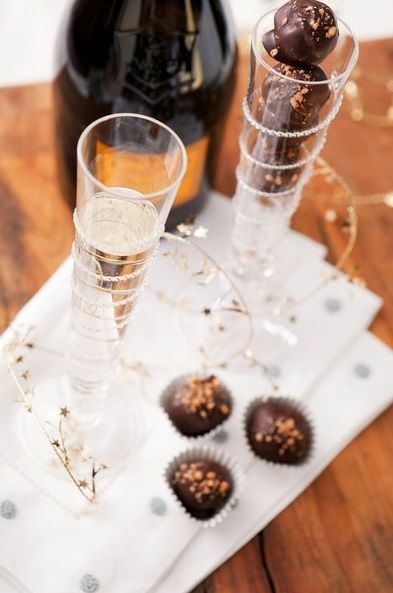 Juliska’s “Amalia Flutes, festively filled with chilled bubbly or scrumptious chocolate truffles, make for the perfect party accessory.” Photo via Juliska’s Pinterest Board, A Sparkling Soiree. Janet Brown Interiors is your Richmond source for Juliska. 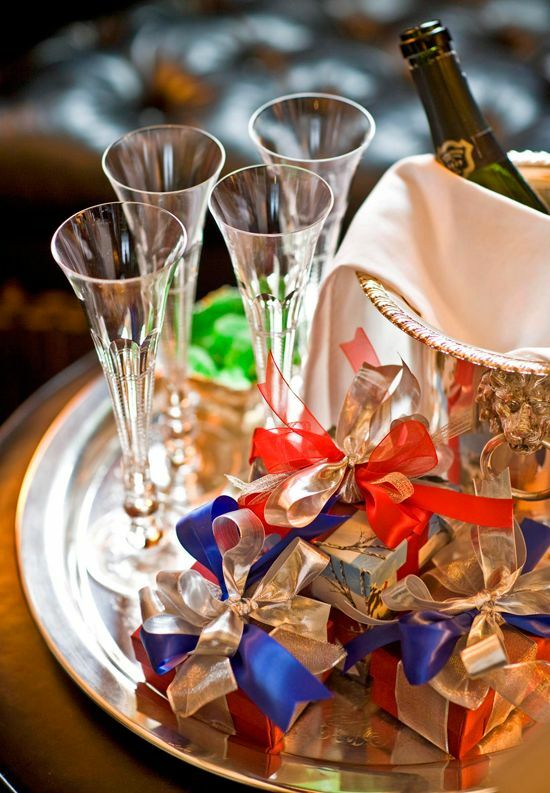 Don’t forget to serve sparkling waters or fruit juices as festive libations for guests who do not drink alcohol. “Party Pics: Telfair Museums’ Annual Telfair Ball” (Savannah, Georgia) Dinner by Lee Epting Events. Photography by Margaret Houston. Garden and Gun. 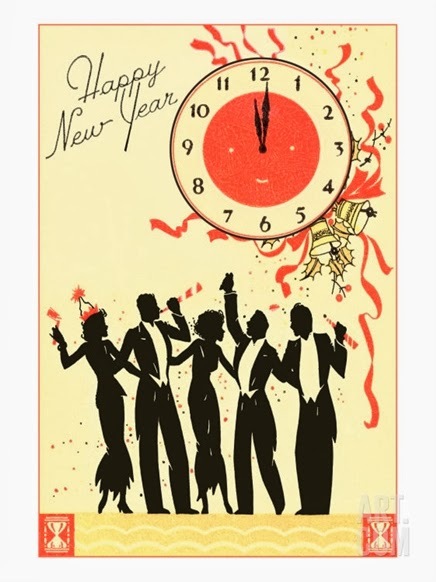 “Happy New Year, Men in Tuxedos, Clock at Midnight” Reproduction from vintage postcard or vintage print. Photo via art.com. New Year’s Eve is the perfect time to dress up your table. 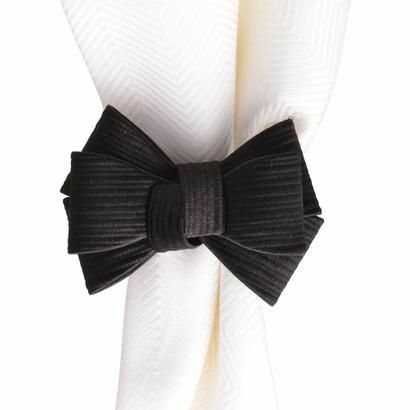 Black Tuxedo Napkin Ring by Juliska. Also offered in Ruby. “Everyday is worthy of fanciful celebration! Our pretty and versatile black tuxedo napkin ring adds a touch of flare to any setting from a casual brunch for two to a formal holiday gathering. 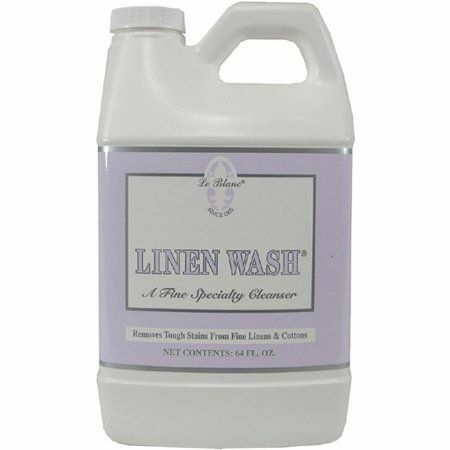 Slip our bow over your favorite linen and, voila! your dinner party is instantly a black tie affair!” Photo via Juliska website. Janet Brown Interiors is your Richmond source for Juliska. 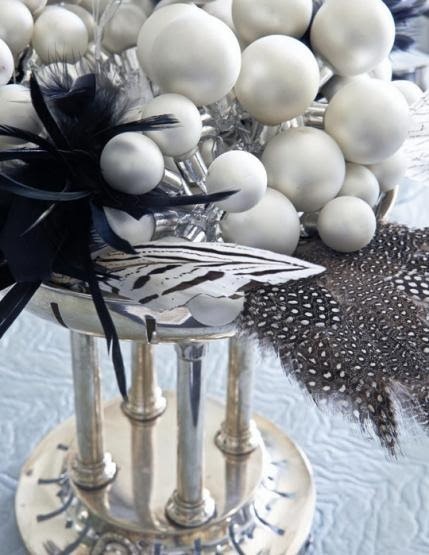 Black, white, silver, and feathers make the evening festive and fun. “New Year’s Eve begs for plenty of sparkle and shine. Gather silver elements such as vases, bowls, and trays, and use them to tie the color scheme together. A chic arrangement of three varieties of black-and-white feathers was displayed in an antique silver container from Mary’s personal collection.” Dinner hosted by interior designer Mary McDonald. Photography by Luca Trovato. “Entertaining: New Year’s Eve Dinner” by Krissa Rossbund. Traditional Home. 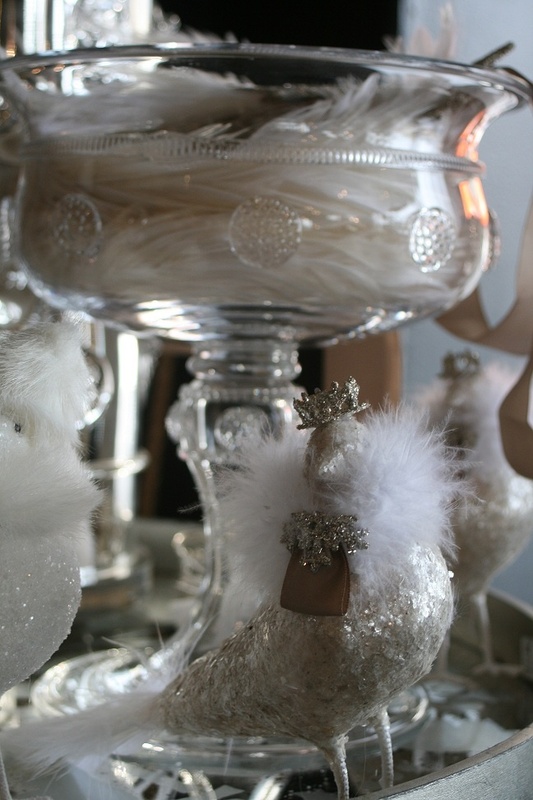 “A sparkling feathered friend and Juliska Isabella compote bowl.” Photo via Juliska’s Pinterest board, Joyeaux Noel. Janet Brown Interiors is your Richmond source for Juliska. Photo of Zelda Fitzgerald. “Roaring Fashion for New Year’s Eve” by M.K. Quinlan. Garden and Gun (December 28, 2012). Did you know that ivy has a role in one Irish New Year’s tradition? Large wreath is English ivy. Mudroom of Loi Thai, owner of Tone on Tone. Interior design by Loi Thai. Photo copyright: Helen Norman. 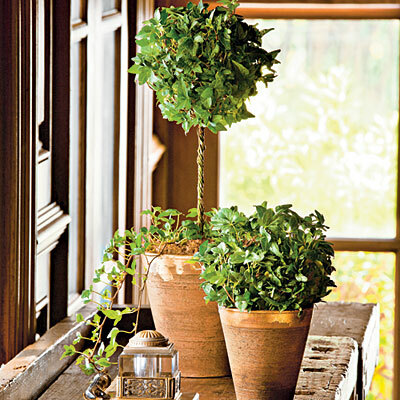 “My Myrtle Topiaries in Southern Living,” Tone on Tone blog (December 26, 2013). According to the Irish Examiner, young women who put holly or ivy leaves under their pillows on New Year’s Eve would dream of their future husbands. 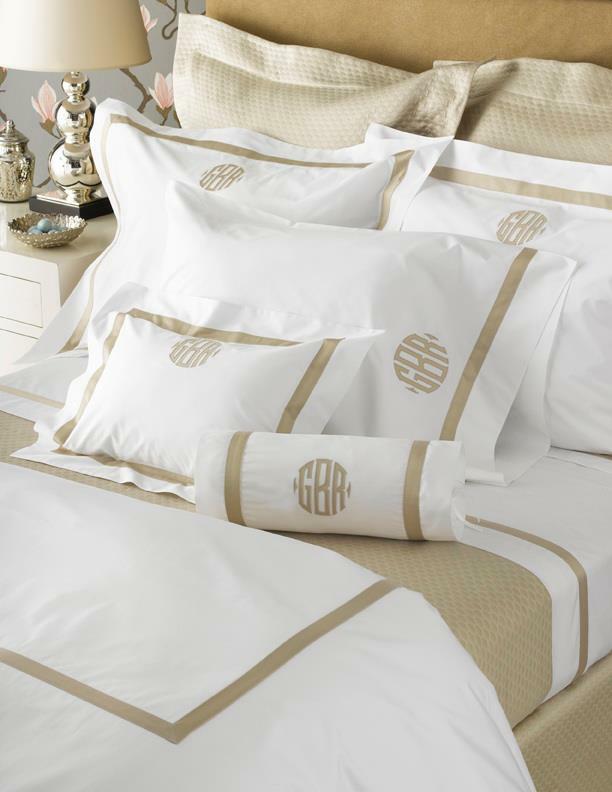 Matouk bedding is available through Janet Brown Interiors. 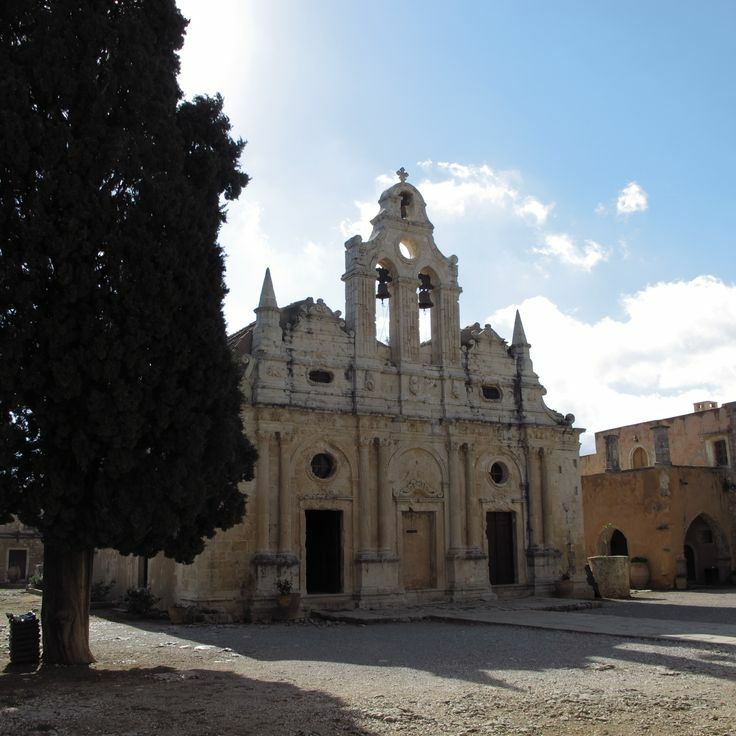 Photo via Matouk website. Janet Brown Interiors offers faux topiaries, which add a touch of green after Christmas trees and holiday greenery are removed. 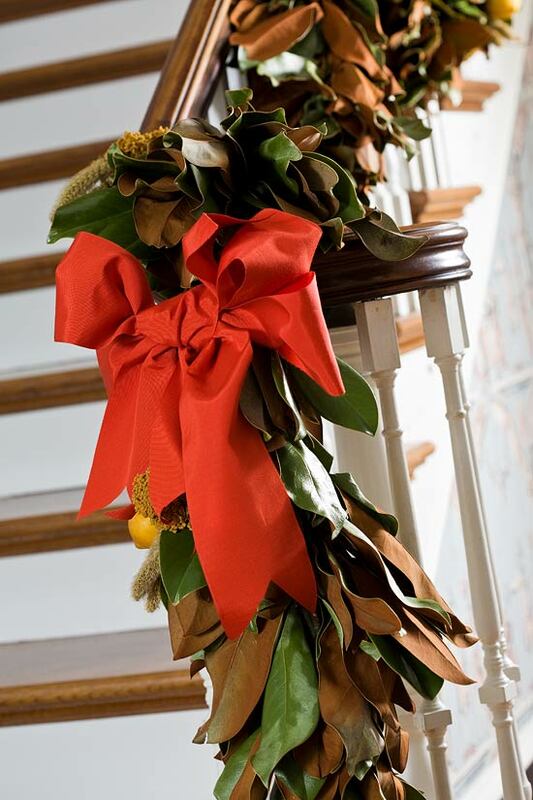 “Fill the void once occupied by holiday decor with this quick fix from your garden center. English ivy topiaries that are pretrained on metal forms, like the lollipop and globe shapes above, take up little space but add big flair.” Photo: Robbie Caponetto. 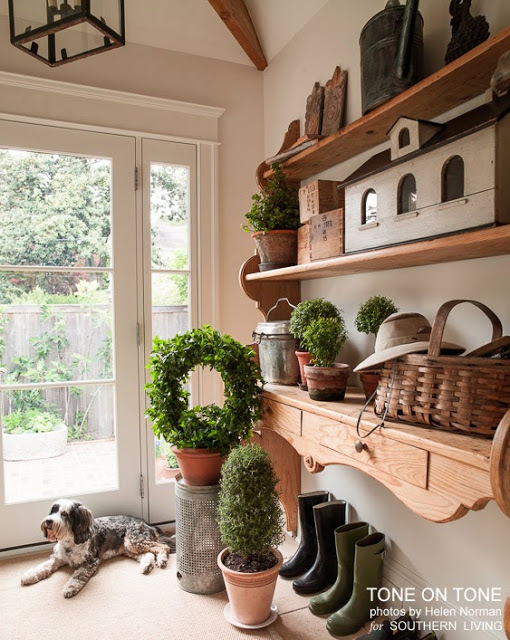 “Potted Topiary Trees for Winter,” Southern Living. Hoppin’ John is a dish that many Southerners eat on New Year’s Day for luck. It is made from pork, rice and dried peas – usually black-eyed peas. This mini version is perfect for serving to guests. Click here for the recipe. 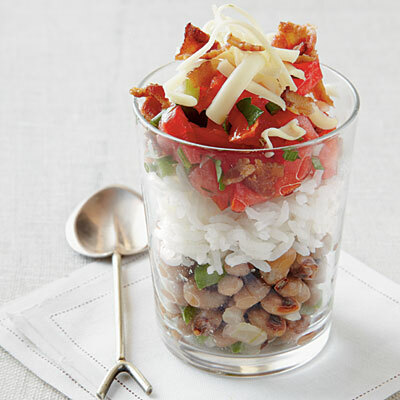 “Hoppin’ John Parfaits: Layer black-eyed pea mixture, hot cooked rice, and tomato mixture in 12 (7-oz.) 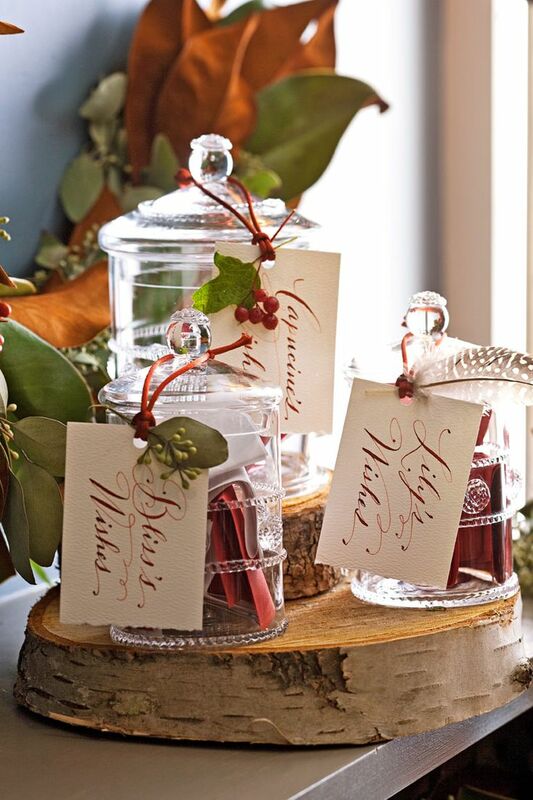 glasses for a charming presentation.” Photo: Jennifer Davick. “14 Festive Mini Appetizers,” Southern Living. 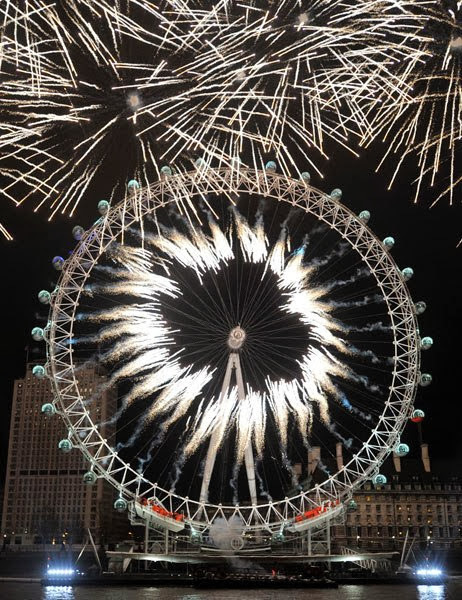 Fireworks display above the River Thames and the London Eye. Photo: EPA/Daniel Deme. “The Most Extravagant Ways to Ring in the New Year” text by Andrew Sessa. Architectural Digest (2013). Revelers have been gathering in New York City’s Times Square since 1904 to celebrate New Year’s Eve. In 1907 the first New Year’s Eve Ball made its descent from the flagpole atop One Times Square. The original Times Square ball. 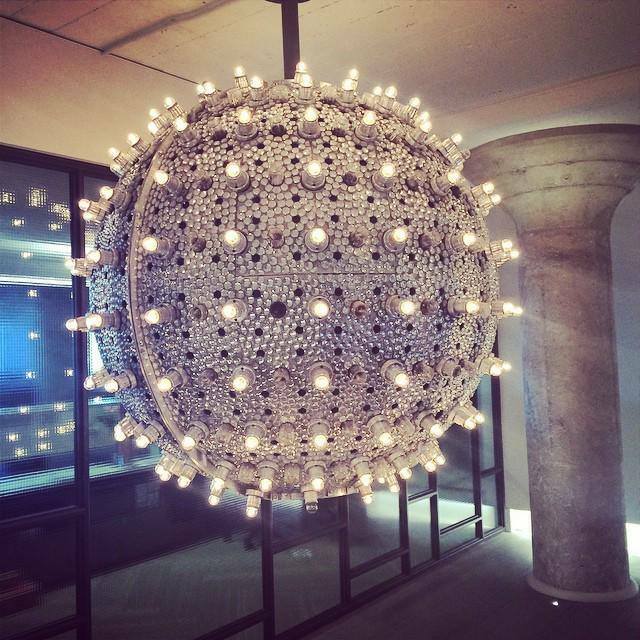 “Seven versions of the Ball have been designed to signal the New Year. The first New Year’s Eve Ball, made of iron and wood and adorned with one hundred 25-watt light bulbs, was 5 feet in diameter and weighed 700 pounds. It was built by a young immigrant metalworker named Jacob Starr, and for most of the twentieth century the company he founded, sign maker Artkraft Strauss, was responsible for lowering the Ball.” Photo via Times Square Ball’s Facebook page. Juliska’s Amalia Globe Pendant. “With a vivacious swirl and chic simplicity, this glamorous globe makes light work of infusing a room with style. Equally fetching when floating alone above a table or as a brilliant line of three over a countertop. 60 watt recommended. 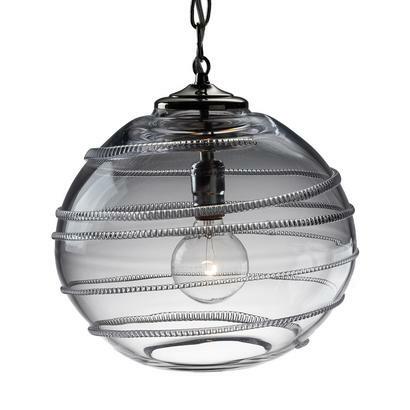 Globe is clear glass with silver chain.” 12″ W by 10.5″ H. Photo via Juliska website. 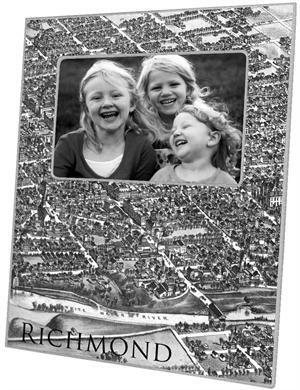 Janet Brown Interiors is your Richmond source for Juliska. Candlelight is so flattering! 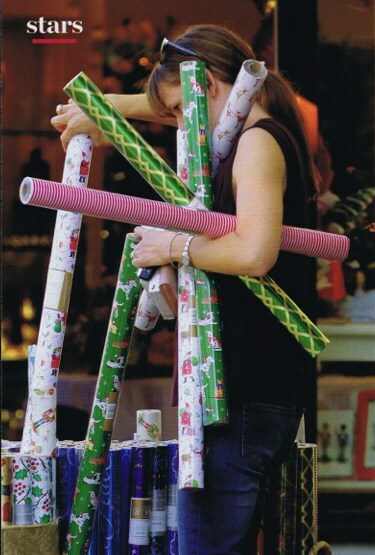 Don’t forget to visit Janet Brown Interiors for holiday tapers. Juliska’s Medici flutes. 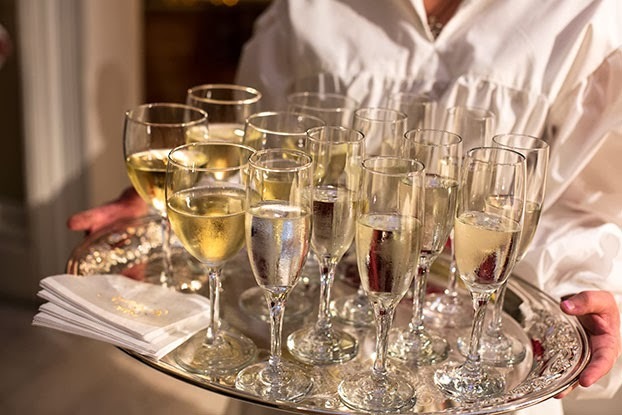 Photo via Juliska’s Pinterest board, A Sparkling Soiree. Janet Brown Interiors is your Richmond source for Juliska. Hospitality is an important part of Scottish New Year’s traditions. According to the Scottish tradition of the “first footer,” the first person to step into one’s home in the new year sets the tone for that household’s fortune. The most welcome “first footer” traditionally has been a young, handsome man bearing gifts such as coal or a loaf of bread. The man should be dark-haired because a blond-haired visitor in Viking days – when first-footing began – often meant trouble. 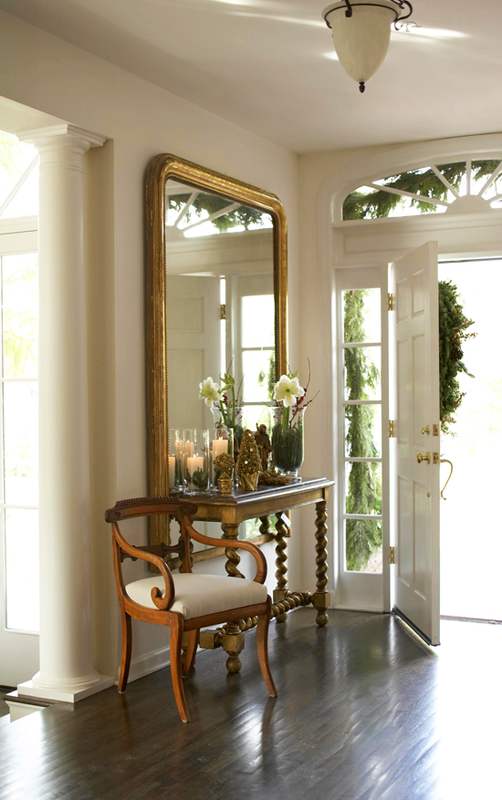 “An oversized gilded mirror serves as backdrop for this elegant foyer. White candles twinkle against the gold frame and ornamental holiday statues.” Photo: Colleen Duffley. “Festive Holiday Staircases and Entryways” written and produced by Lucy Fitzgerald. Traditional Home. Happy New Year from Janet Brown Interiors! Do you love the look of an evergreen but lack the space for a full-size Christmas tree? Do you wish you could add small touches of greenery throughout your home – even in the kitchen and bedroom? Tabletop trees provide the perfect way to celebrate the season in any room of your house. Place a mini fir on a console table or festoon a tree in the kitchen with gingerbread men. Faux trees made of feathers add a whimsical touch. Janet Brown Interiors offers a selection of tabletop trees and ornaments to decorate your home. Here are some photos for inspiration . 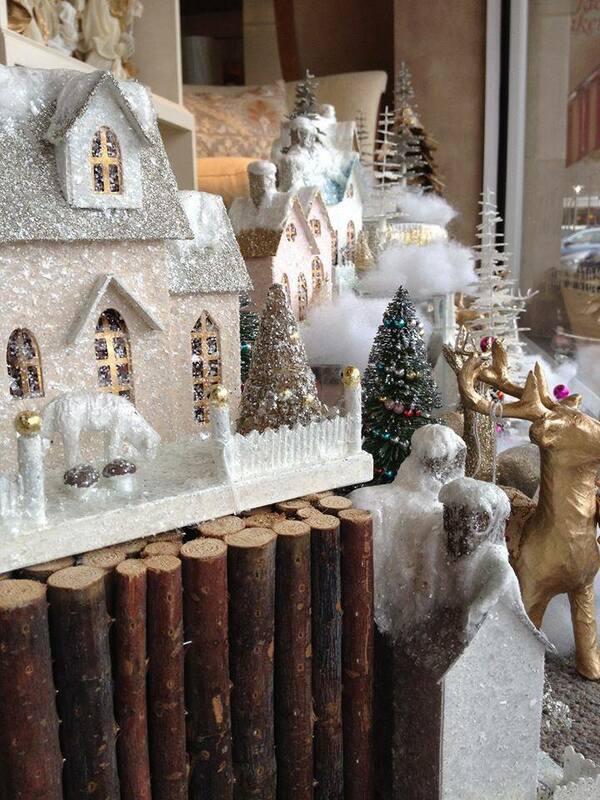 . .
Janet Brown Interiors offers trees and houses so you can create your own Snow Village. 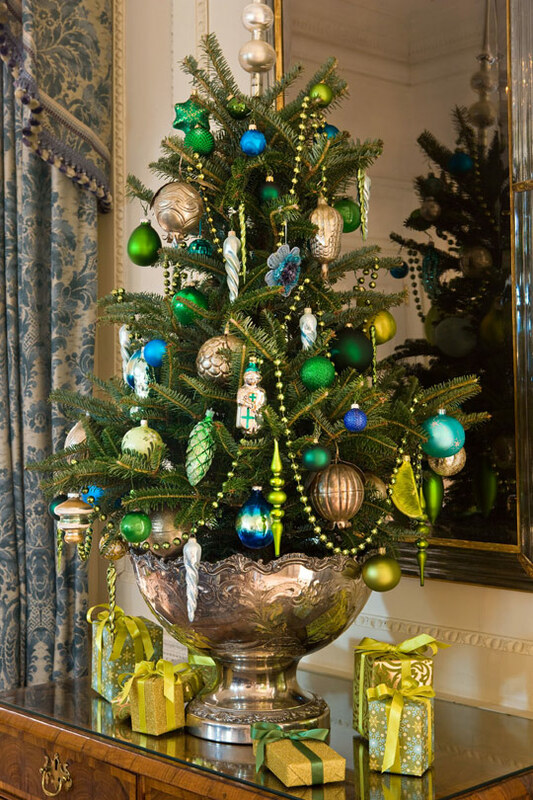 “Victorian beadwork and antique ornaments adorn a small tree.” Blair House, the president’s official guesthouse for foreign heads of state visiting Washington. 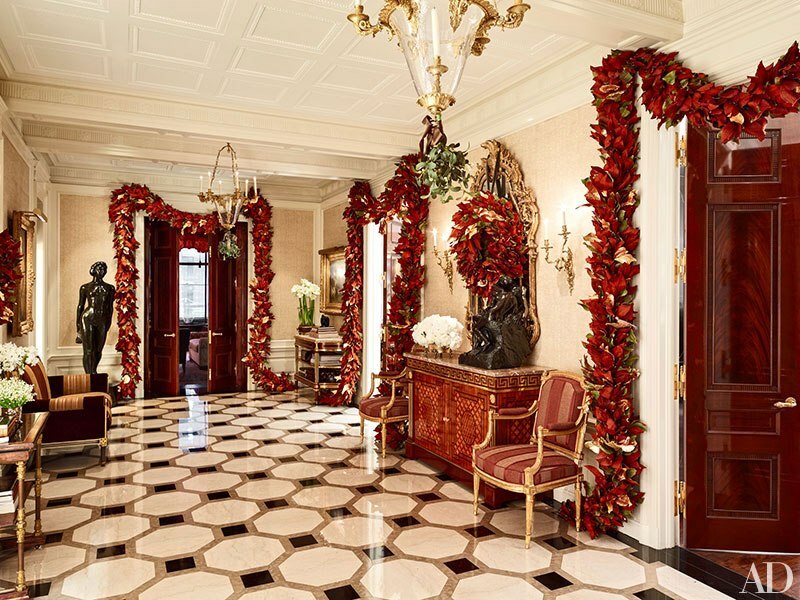 D.C. Holiday decor by interior decorator Barry Dixon and floral designer Barbara Hamilton of The Ociana Group. Photography by Gordon Beall. “Decorating: A Capital Christmas” text by Jenny Bradley. Traditional Home. “Placed in front of a mirror against gorgeous wallpaper, a small tree provides a classic holiday touch.” “Decorating: Christmas Trees!” Traditional Home. 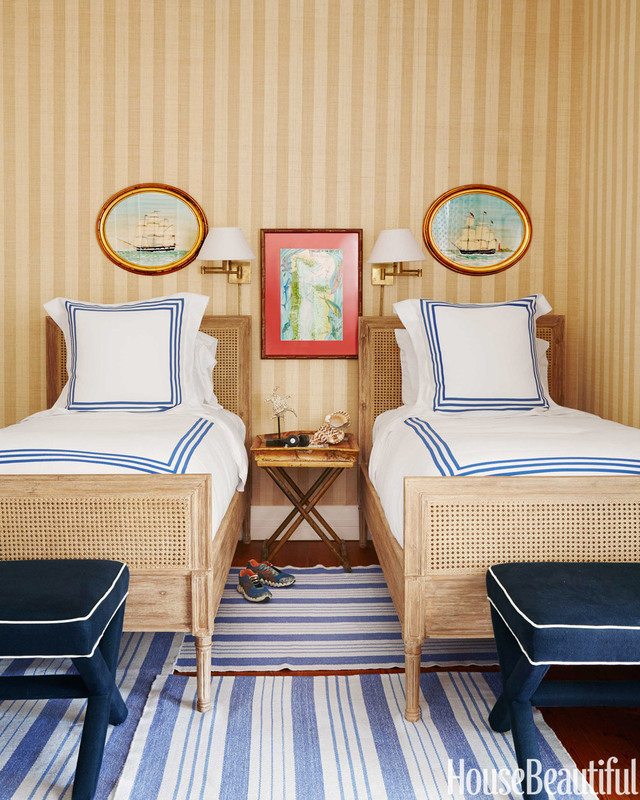 “Less expected than pots of traditional poinsettia or paperwhites, a small evergreen in a burlap-wrapped container enlivens a guest bedroom or den.” Interior design by Barbara Purdy, Barbara Purdy Design. Photography by Angus Fergusson. “A Potted Tree,” Canadian House and Home (December 2011). 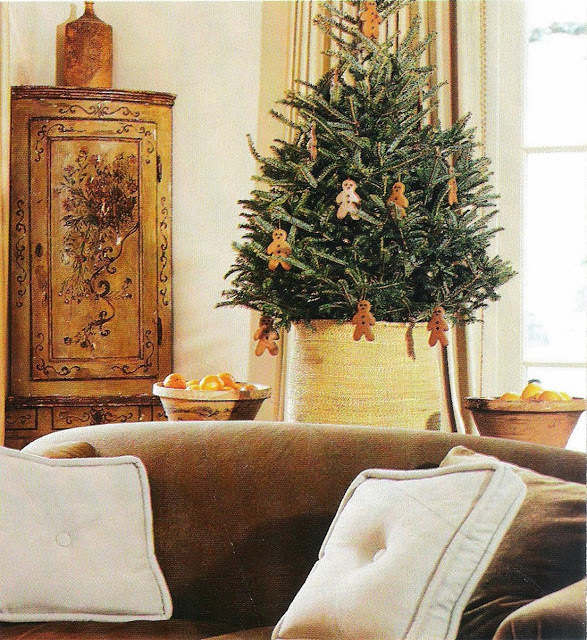 “The family enjoys snacking on gingerbread men hung from the tree, which can be planted after the holidays.” Interior design by Pamela Pierce, Pierce Designs and Associates. Photography by Tria Giovan. “Tailor-Made Trimmings” by Lydia Somerville. Southern Accents (November – December 2003). “The dining table features a composition of cake stands with compotes of roses, peonies, and kumquats, wreathed by whimsical snow-covered trees.” Houston, Texas, home of Michelle Stewart and her family. Interior design by Michelle Stewart. Photography by Tria Giovan. Written by Jill Kirchner Simpson. “White Christmas” produced by Susanna Showers Moldawer. Southern Accents (November – December 2005). “Swags of noble fir crown each window, while vintage-inspired white feather trees nestle on a marble-top chest.” Houston, Texas, home of Michelle Stewart and family. Interior design by Michelle Stewart. Photographed by Tria Giovan. Written by Jill Kirchner Simpson. “White Christmas” produced by Susanna Showers Moldawer. Southern Accents (November – December 2005). “In the family room, white canvas slipcovers dress club chairs from the ’40s. Sand dollars serve as ornaments on the miniature tree.” Houston, Texas, home of Michelle Stewart and family. Interior design by Michelle Stewart. Photographed by Tria Giovan. Written by Jill Kirchner Simpson. “White Christmas” produced by Susanna Showers Moldawer. 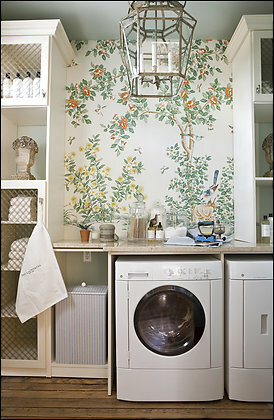 (Photo found on Southern Living website.) Originally published in Southern Accents (November – December 2005). 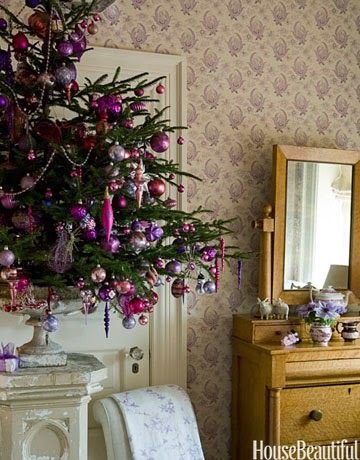 “Amethyst and icy blue ornaments suit the charming color scheme in daughter Caroline’s room. Even the chandelier has lavender crystals.” Houston, Texas, home of Michelle Stewart and family. Interior design by Michelle Stewart. Photographed by Tria Giovan. Written by Jill Kirchner Simpson. “White Christmas” produced by Susanna Showers Moldawer. 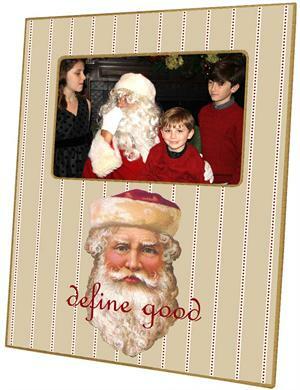 (Photo found on Southern Living website.) Originally published in Southern Accents (November – December 2005). ” ‘We always throw a big party for about 400 people, and I started putting trees throughout the house to get guests to circulate and not congregate in the one room with the one tree. Most of them are live and in the root ball and get replanted on my farm after the holidays, in a spot we call Christmas Tree Corner. We put the little purple one in my niece Lauren’s room about nine years ago. She never wanted to go to bed and leave the tree in the living room, so she got her own. I made it purple because that went with the lavender-print Kathryn Ireland wallpaper in her room.’ ” Interior design by Barry Dixon. “Christmas Tree Decorating Ideas” by Shax Riegler. House Beautiful. 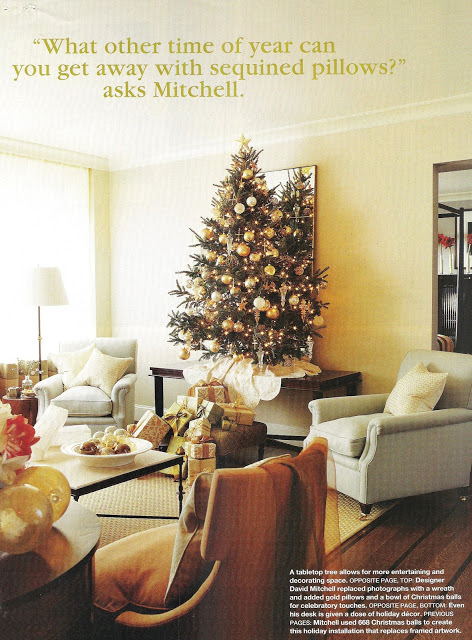 “A tabletop tree allows for more entertaining space.” Interior design by David H. Mitchell. Photography by Keith Scott Morton. “Counting on Christmas” by Leslie Dunne Sadler. Southern Accents (November – December 2003). Tyler, Texas, home of Ellisiv and Chad McNeil. Interior design by Meredith McBrearty. Photography by Emily Minton Redfield. Written by Amy Elbert. 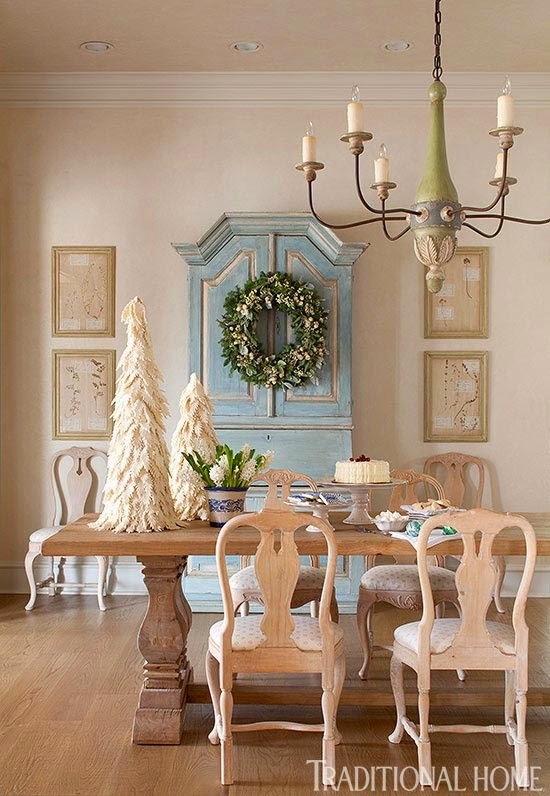 “Scandinavian-Style Christmas: Pretty Texas Home” produced by Elizabeth R. Beeler. Traditional Home. 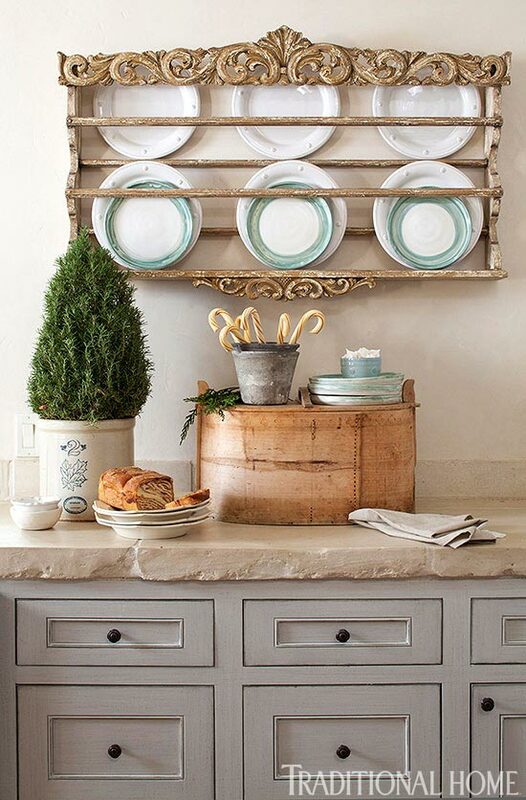 “A hand-crafted Norwegian plate rack adds vintage charm, hanging above a wood picnic box from Norway that dates to the 1850s.” Tyler, Texas, home of Ellisiv and Chad McNeil. Interior design by Meredith McBrearty. Photography by Emily Minton Redfield. Written by Amy Elbert. 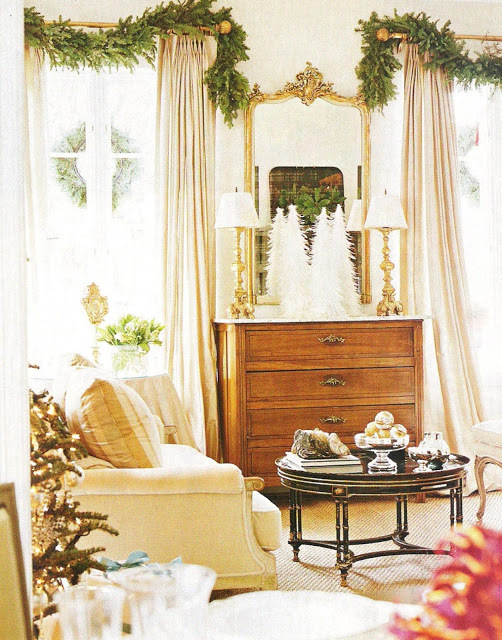 “Scandinavian-Style Christmas: Pretty Texas Home” produced by Elizabeth R. Beeler. Traditional Home. 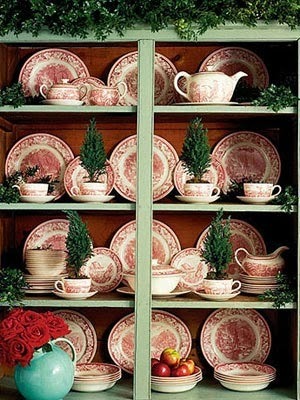 “A matching set of mid-20th-century Currier and Ives transferware really shines in this green cupboard. Mini trees in teacups complete the look.” Photography by Michael Luppino. “101 Holiday Decorating Ideas,” Country Living. “Caroling with friends always makes for a memorable holiday tradition.” “A Canine Christmas,” Traditional Home. Don’t forget your animal friends this season! Janet Brown Interiors has plenty of pet ornaments for your Christmas trees, as well as dog pillows and other accessories for the animal lovers in your life. Let us help you check some things off your holiday to-do list! Magnolias are a favorite flower in the South, and the glossy green leaves with brown undersides are perfect for holiday garlands. You can make your own, or you can visit Janet Brown Interiors for lengths of faux magnolia that are easy to drape in your home this season. Here are some photos for inspiration . 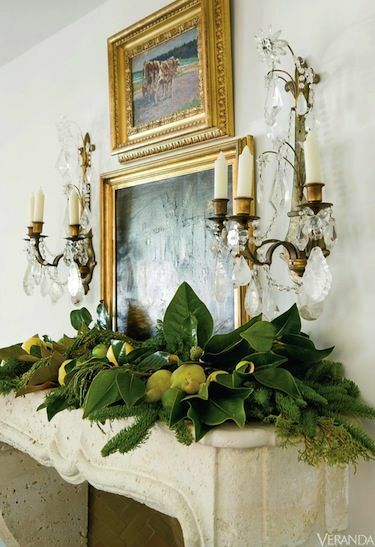 . .
“Pears, lemons, limes and magnolia branches enliven a garland on the mantel. Antique French rock-crystal sconces.” Interior design by Lisa Luby Ryan. Photo: Erica Georges Dines. Text by Linda E. Copton. 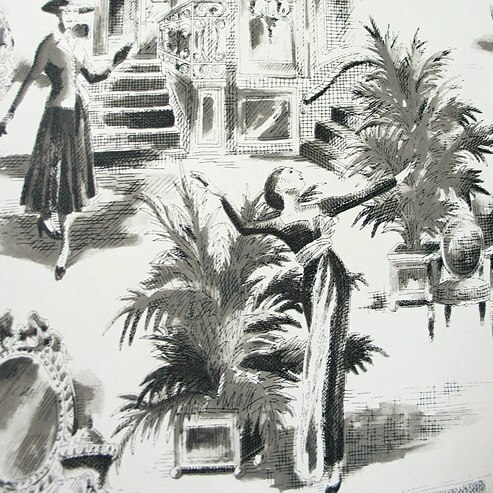 “Season’s Greenery,” Veranda (November – December 2010). 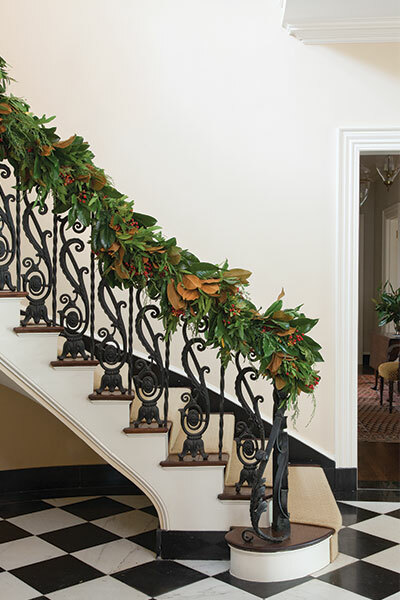 “In the entry hall, a magnolia garland winding up the balustrade is adorned with lemons and coral ribbon.” Jon and Jennifer Abramczyk’s 1928 Wilmington, Delaware Colonial home. 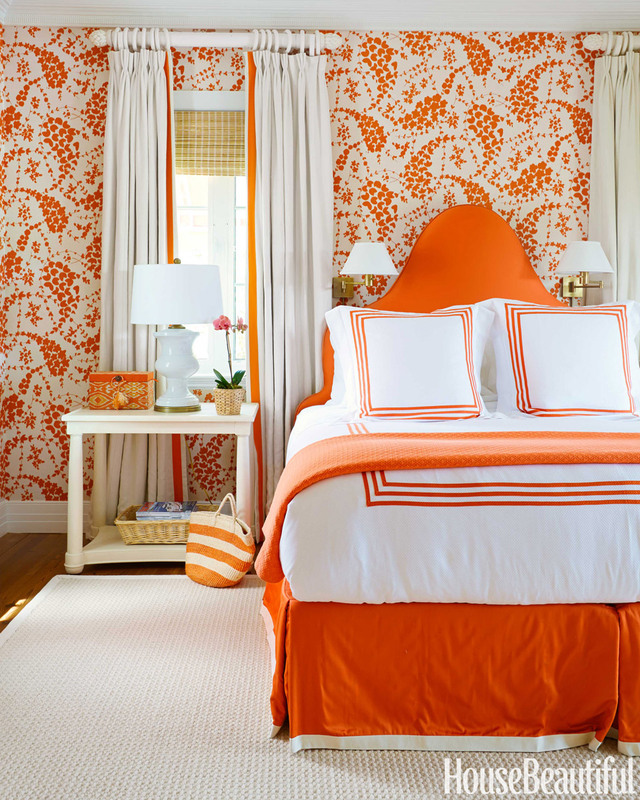 Interior design: Courtney Coleman and Bill Brockschmidt, Brockschmidt and Coleman LLC, Decorating and Design. Architect for addition: John Milner. Photo: Gordon Beall. Text: Krissa Rossbund. “Homemade Holidays” produced by Eileen A. Deymier. Traditional Home. 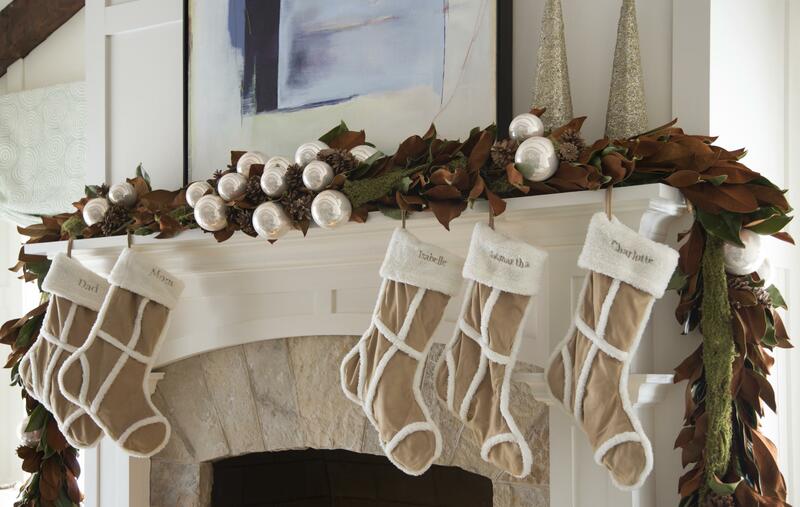 “The shearling stockings on the mantel are embroidered with the family’s names and blend with the neutral color palette of the family room. 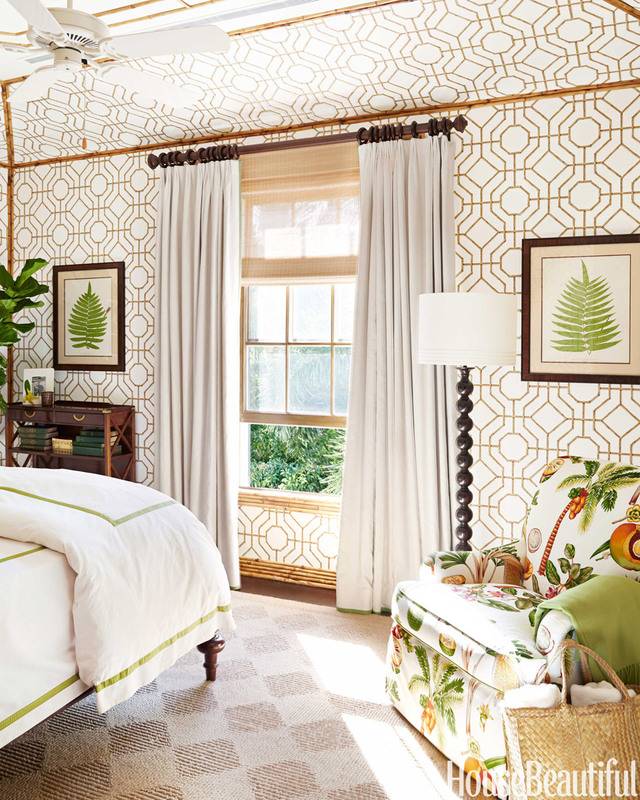 Pinecones and pearlescent balls are tucked into the green-and-brown garland, continuing the natural color scheme.” Design by Gerald Pomeroy. Photo: Eric Roth. “Decorating: Holiday Mantels,” Traditional Home. “Denim-wrapped pinecones: Thanks to a renewed interest in hardworking, Southern-milled denim over the last few years, the material is enjoying a renaissance. So much so that it’s even being produced as decorative ribbon, available via sites such as Etsy. We wrapped Slash pinecones (abundant all over the deep South) with the ribbon and wove it into the greenery, leaving the ends loose.” Garland from North Carolina’s Weston Farms. 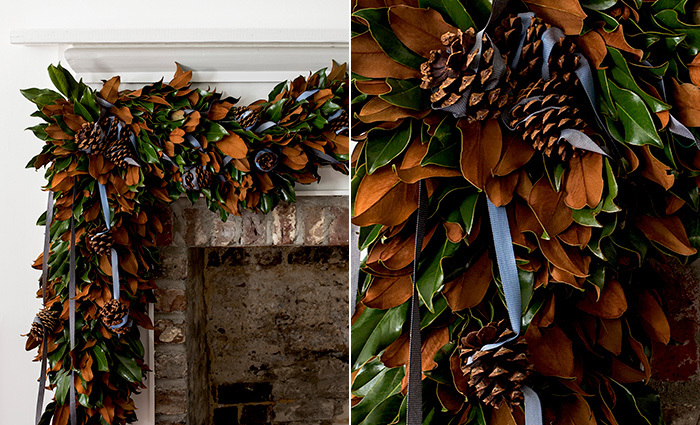 “Southern Magnolia Garland: 3 Easy Ways” by Haskell Harris, Garden and Gun (December 1, 2014). “How To Decorate a Holiday Mantel” -“Step One: Mix your greens. ‘It’s nice to use three different types of greenery—one for a wreath and two others for garlands,’ says designer Phoebe Howard. Her favorites are fresh magnolia, Fraser fir, and boxwood. Step Two: Layer for lushness. 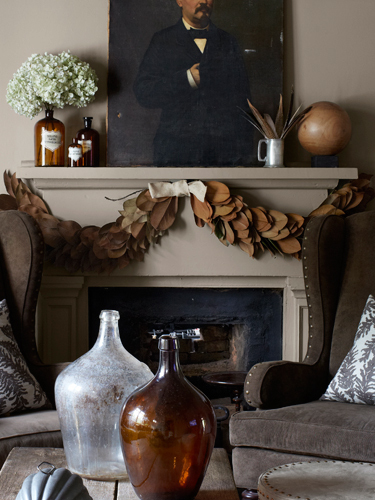 Across the top of the mantel, arrange a thick length of garland. Wire a green bow to the middle, and then artfully weave the ribbon tails throughout. 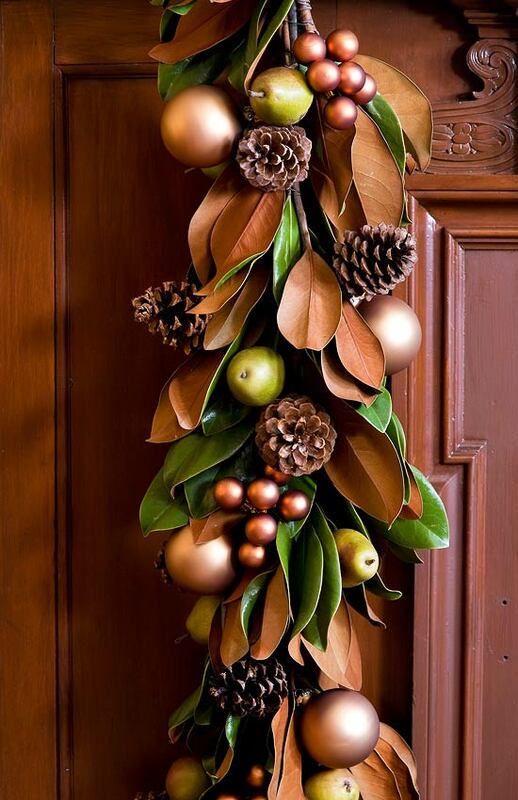 Work in pinecones, berry branches, and various greenery sprigs for color and texture. Step Three: Balance the swoop. 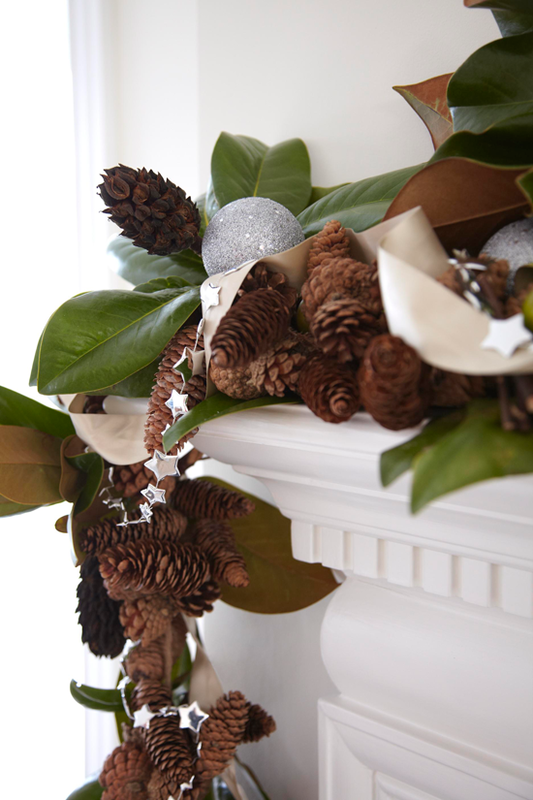 To hang the lower garland, start by securing the middle of it to the mantel with a removable adhesive hook and wire. Evenly swag one length to the right and the other to the left, securing at the corners. ‘Make sure you have at least 3 feet dropping down on each side,’ says Phoebe. Step Four: Crown with a wreath. Use monofilament fastened to the back of a mirror to hang the wreath; then wire a bow to the top. ‘But never hang anything over a piece of art,’ says Phoebe. ‘If necessary, remove the artwork and hang the wreath directly on the wall.’ ” Photo: Laurey W. Glenn. Article: Zoe Gowen. Southern Living. “I love mimicking nature in my designs, and what’s natural is often unruly. So remember that a garland doesn’t always have to be structured; it can be loose and free flowing too. You really can’t mess it up!”—JESSICA SLOANE. Garland by Nashville event designer Jessica Sloane. Photo by Caroline Allison. “Deck the Halls” produced by Alexandra Schmitt. Flower Magazine. “Magnolia garland is beautiful all by itself, whether you hang it around a front door or drape it across a mantle. 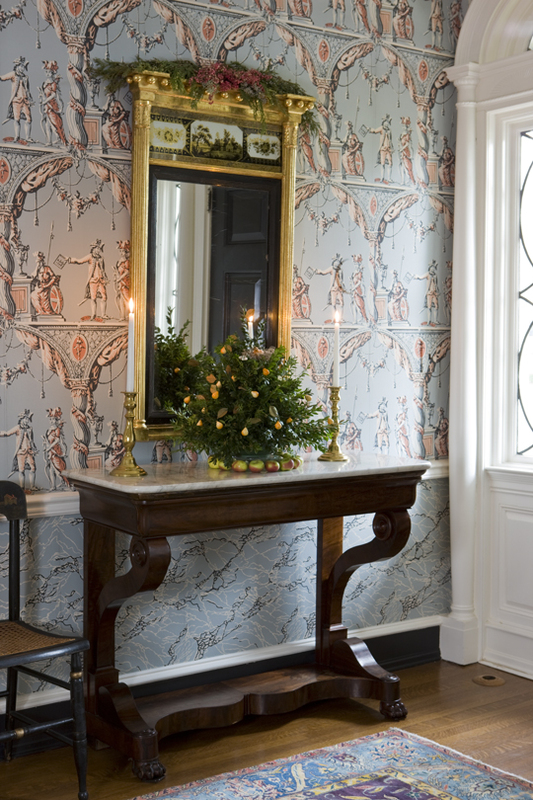 But adding a little embellishment – such as Moravian Star Ornaments – sets off all that shiny, lush greenery even more. Handmade from paper in the eighteenth-century village of Old Salem, North Carolina, the 26-point shape represents the star of Bethlehem, and was introduced to America by German settlers. The delicate works of art come in three sizes.” Garland from North Carolina’s Weston Farms. 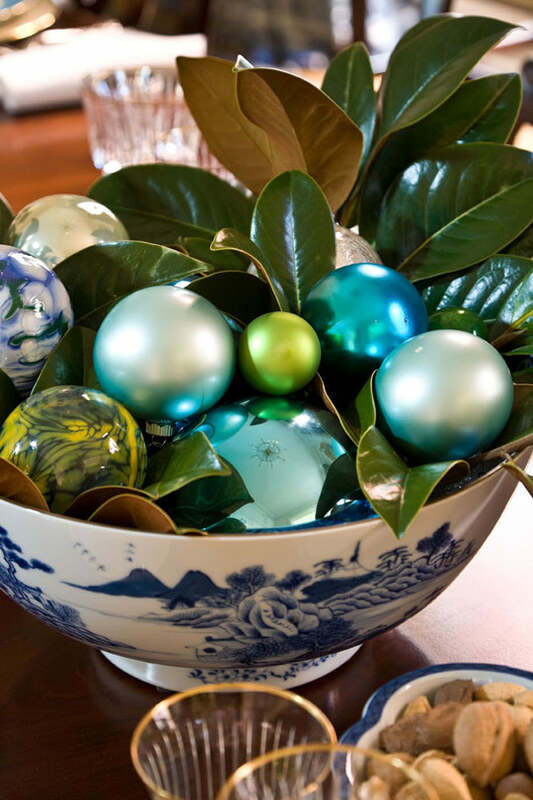 “Southern Magnolia Garland: 3 Easy Ways” by Haskell Harris, Garden and Gun (December 1, 2014). 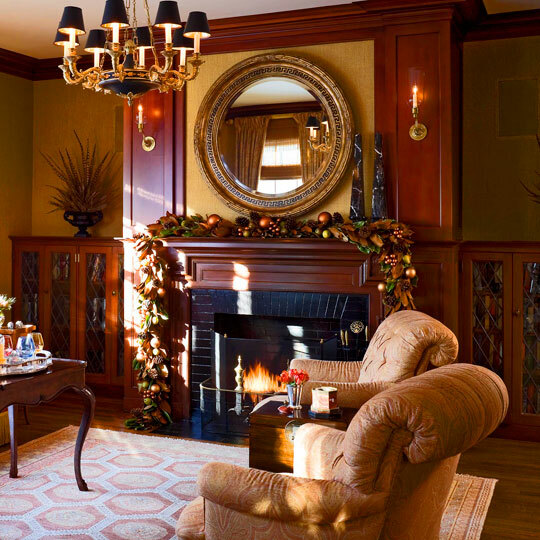 “The classic library, complete with built-in bookcases, exhibits a striking, dark-hued holiday garland on the mantel.” Catherine and Peter Malone’s 1910 Colonial Revival house in Milton, Massachusetts. Floral design: Daniel Lopez-Ospina and Jeb Taylor, New Leaf Flores. Interior design: Gerald Pomeroy. Photo: Bruce Buck. Text by Krissa Rossbund. “Colorful Christmas in a Colonial” produced by Estelle Bond Guralnick. Traditional Home. “Magnolia leaves, pears, and copper-colored glass balls create the masculine library garland.” Catherine and Peter Malone’s 1910 Colonial Revival house in Milton, Massachusetts. Floral design: Daniel Lopez-Ospina and Jeb Taylor, New Leaf Flores. Interior design: Gerald Pomeroy. Photo: Bruce Buck. Text by Krissa Rossbund. “Colorful Christmas in a Colonial” produced by Estelle Bond Guralnick. Traditional Home. 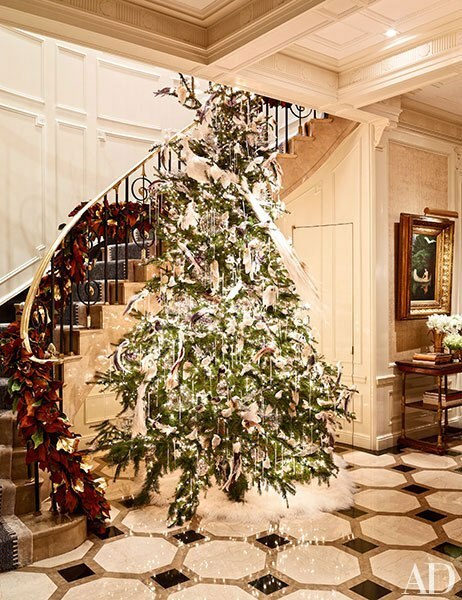 “In the entrance gallery of a Manhattan family’s duplex apartment stands a Mongolian-sheepskin-skirted Christmas tree, part of a decor created for the home by the event-planning firm Van Wyck and Van Wyck; a gilded magnolia garland traces the staircase’s balustrade.” Photography by Joshua McHugh. Text by Christopher Mason. “Bronson van Wyck Brings the Holiday Spirit to a Manhattan Apartment” produced by Anita Sarsidi. Architectural Digest (December 2014). “Magnolia leaves—some painted gold—distinguish the entrance gallery’s lush wreaths and garlands. White flowers, including narcissus and amaryllis, add fragrance, while mistletoe dangles from the lanterns.” Event planner: Bronson van Wyck. Photography by Joshua McHugh. Text by Christopher Mason. “Bronson van Wyck Brings the Holiday Spirit to a Manhattan Apartment” produced by Anita Sarsidi. Architectural Digest (December 2014). 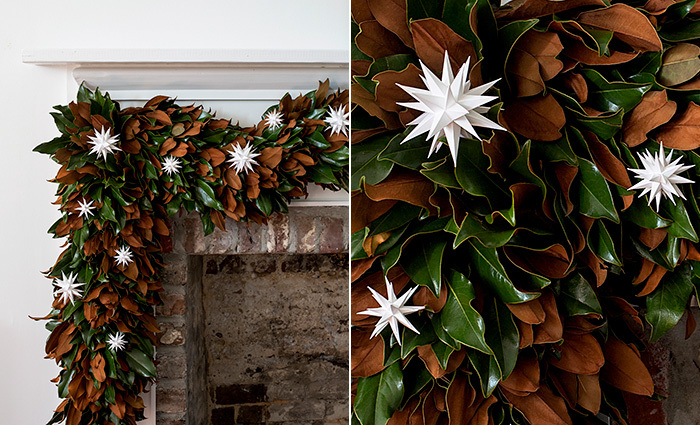 This magnolia leaf garland “uses the broad leaves of a magnolia, which are ideal for making a natural garland to spruce up a fireplace. Plus, the neutral hue saves this show-stopper from being strictly seasonal. ” “6 DIY Garlands to Make this Fall” by Michelle Profis. Country Living. “To get this look, start with a store-bought garland. Space five pieces of water-soaked florist foam, secured inside cages, along the mantel. (Cover your mantel in plastic to protect it.) Cover the foam with pieces of store-bought garland. Next, insert clipped magnolia, holly, pine, and cedar into the foam. Make loops from aspidistra leaves by poking the stems through the tips of the leaves. Insert the stems into the foam. Complete the look by layering in milo, millet, and rose hips. On the sides of the garland, wire in items that don’t require water. Fill in holes with more magnolia. Keep it looking fresh by misting with a preservative called Floralife Crowning Glory Solution.” Photo: Emily J. Followill. 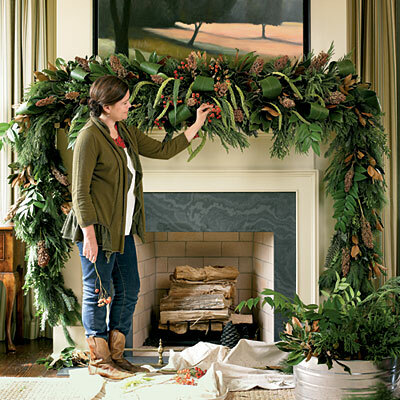 “Dressed-Up Christmas Mantels,” Southern Living. 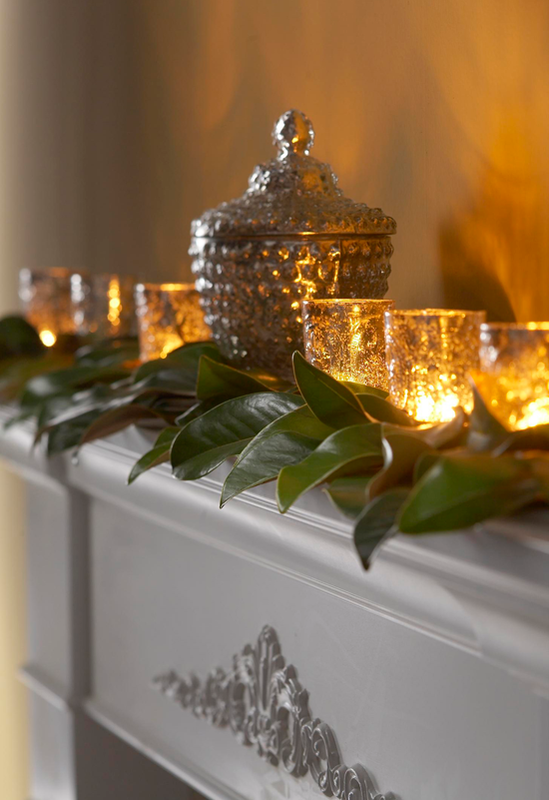 “A row of tea light candles nestled among greenery provides a twinkling glow, perfect for subtle mantel décor. Embellished votives and silver accent pieces lend some extra sparkle.” “Decorating Holiday Mantels,” Traditional Home. “Holiday display goes natural with magnolia leaves, spruce, and pinecones accented with silver.” “Decorating: Holiday Mantels,” Traditional Home. “Table settings were inspired by the Blair House Chinese export porcelain and blue-and-white needlepoint chair seats. 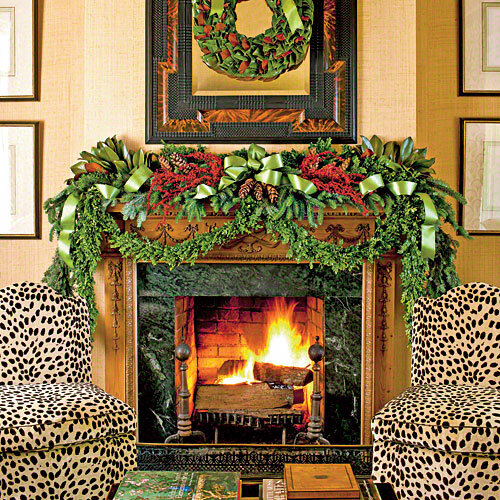 A garland of cedar and juniper adorned with eucalyptus pods, magnolia leaves, nut clusters, and Hypericum berries framed the carved mantel, highlighting the nontraditional holiday palette.” Dining room of Blair House, the president’s official guest house for foreign heads of state visiting Washington, D.C. Holiday decor by interior decorator Barry Dixon and floral designer Barbara Hamilton. Photo: Gordon Beall. “Decorating: A Capital Christmas” written by Jenny Bradley. Traditional Home. 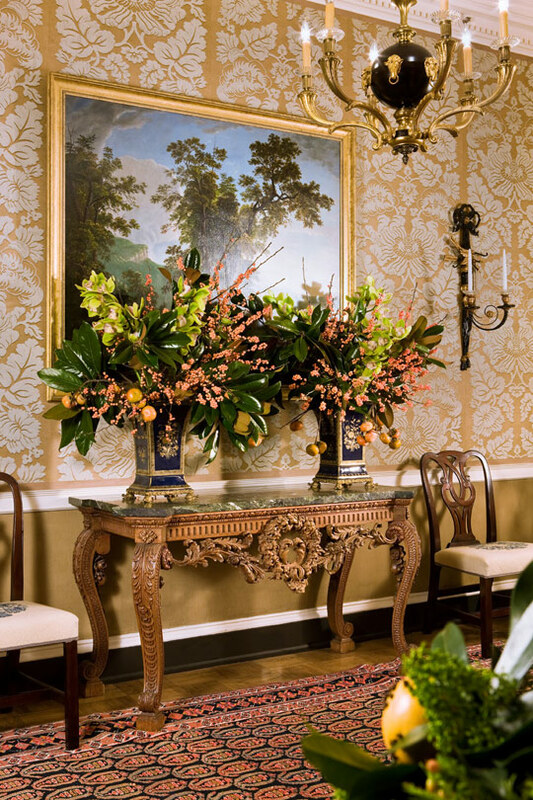 The Lee Entrance Hall at Blair House, the president’s official guest house for foreign heads of state visiting Washington, D.C. Holiday decor by interior decorator Barry Dixon and floral designer Barbara Hamilton. Photo: Gordon Beall. “Decorating: A Capital Christmas” written by Jenny Bradley. Traditional Home. 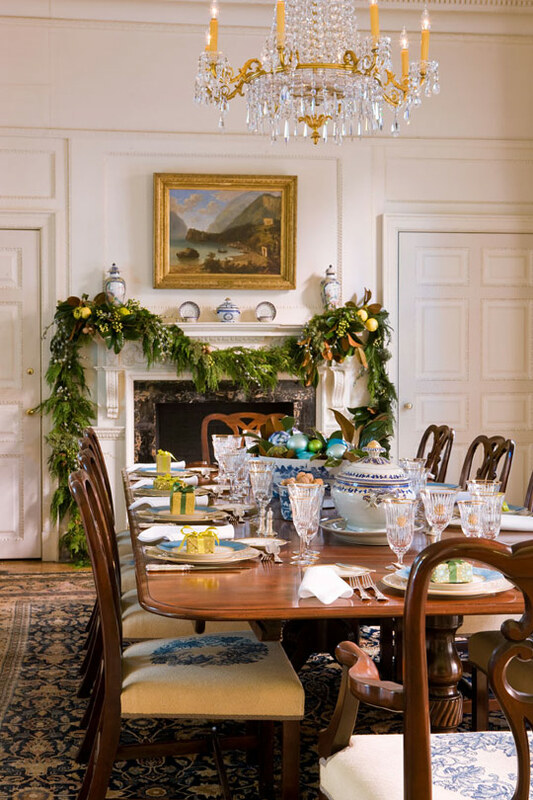 “Instead of a floral centerpiece, Dixon filled a large bowl with art glass ornaments nestled in magnolia leaves.” Dining room at Blair House, the president’s official guest house for foreign heads of state visiting Washington, D.C. Holiday decor by interior decorator Barry Dixon and floral designer Barbara Hamilton. Photo: Gordon Beall. “Decorating: A Capital Christmas” written by Jenny Bradley. Traditional Home. Happy decorating from Janet Brown Interiors! We have 12-foot faux magnolia garlands, glass balls, stockings, Santas, holiday accessories galore, and a helpful staff ready to assist you. ” ‘Never underestimate the power of sparkle,’ says [Victoria] Hagan. 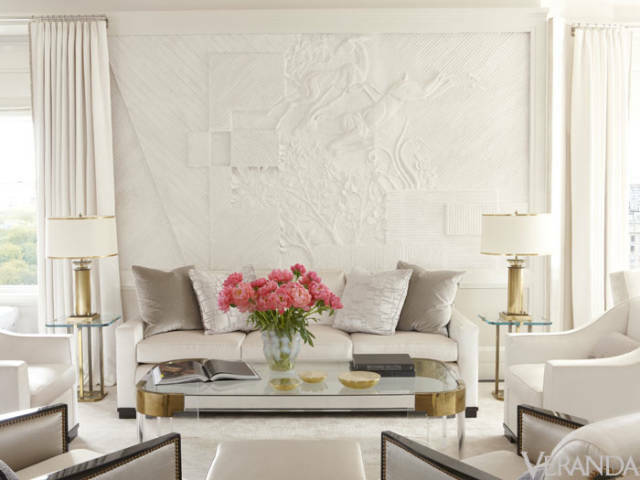 Anchoring the space is a large-scale plaster bas relief by artist Mark Beard, installed over the sofa. 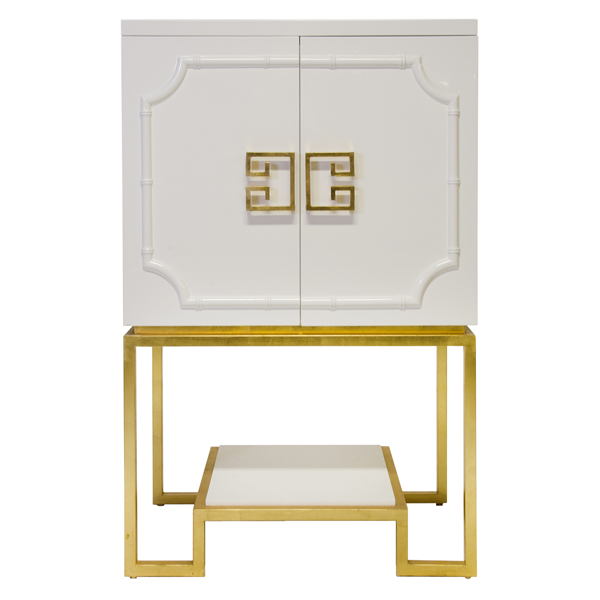 Its graphic Art Moderne lines gently recall the sophistication of the Jazz Era without hitting you over the head, while its powdery, marble-like finish works as a counterpoint to all those glimmering surfaces.” Interior decoration by Victoria Hagan. Photo: Melanie Acevedo. “Well-Lived: Victoria Hagan’s NYC Apartment,” Veranda. 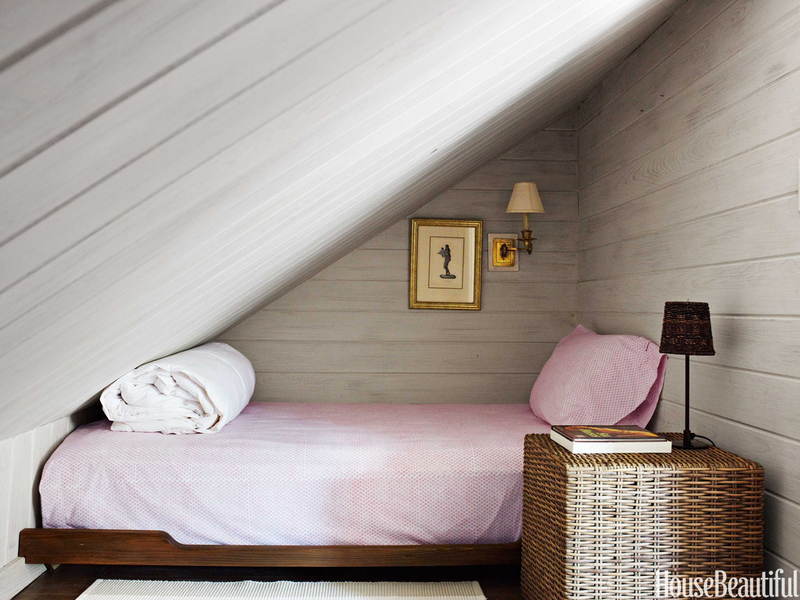 “The dreamy white-on-white scheme ‘makes you feel like you’re floating’ by keeping the boundaries of the space undefined. 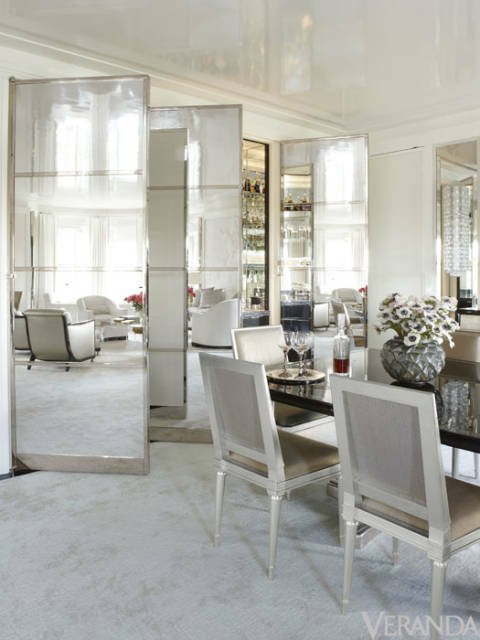 Reflective elements such as a lacquered ceiling, mirrored cabinets, and satin curtains keep the light bouncing and provide dimension.” Interior decoration by Victoria Hagan. Photo: Melanie Acevedo. “Well-Lived: Victoria Hagan’s NYC Apartment,” Veranda. The chair in the master bath is a Suzanne Kasler design for Hickory Chair. 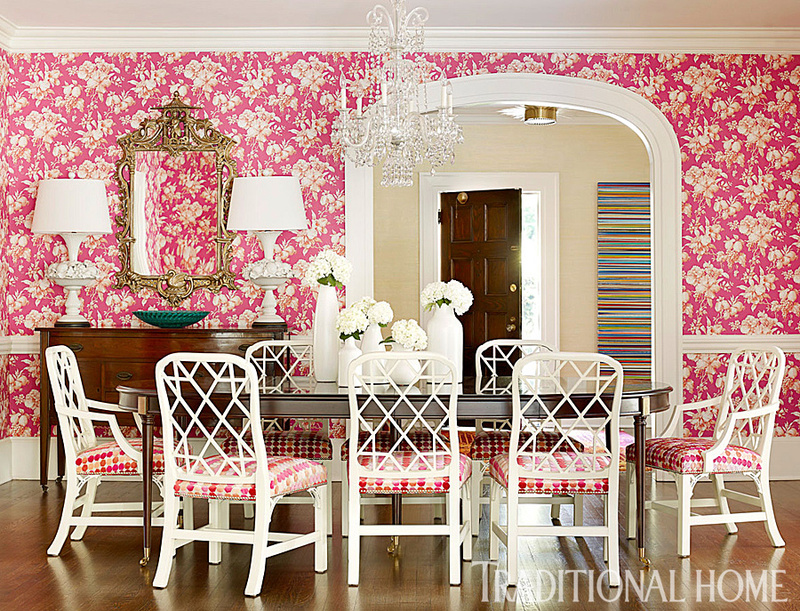 Interior designer Suzanne Kasler’s Regency-style home in Atlanta. Photography by Pieter Estersohn. Text by Jen Renzi. “At Home With Suzanne Kasler” produced by Howard Christian. Architectural Digest (April 2012). ” ‘Linwood’ chairs in ‘Antique Ivory’ by Suzanne Kasler for Hickory Chair. Walls papered in ‘Balata’ by Manuel Canovas for Cowtan and Tout give the dining room a tropical vibe. The crystal chandelier is original to the house, and the white lamps are vintage finds from Florida.” Interior design: Katie Rosenfield. Photo: Lisa Mowry. “Pink in Every Room” by Amy Elbert. Traditional Home. Chest by Worlds Away available through Janet Brown Interiors. Photo via Facebook. Do you remember the chic 1960s Southern California home of Charley, Julianne Moore’s character in A Single Man (the 2009 film directed by Tom Ford and based on the book by Christopher Isherwood)? Charley’s dressing table. 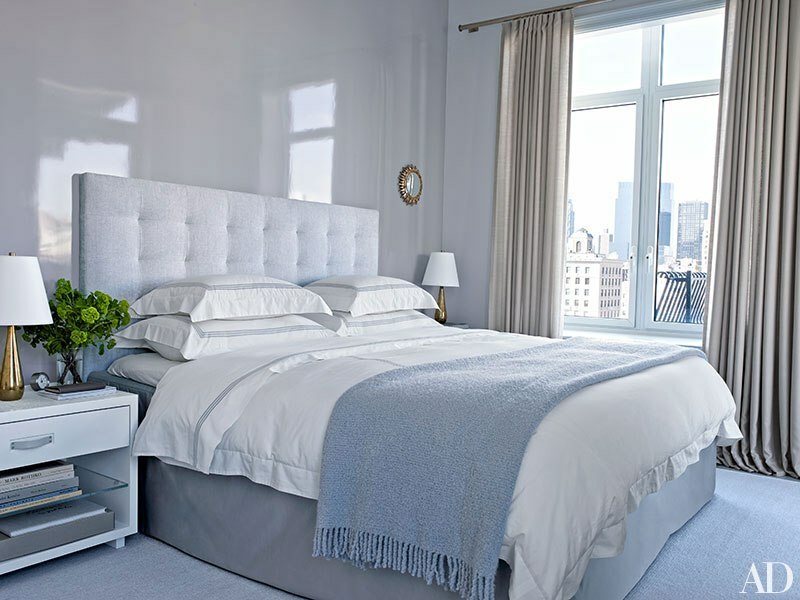 Photo via “Stunning Homes and Interiors from A Single Man are Snubbed by Oscar” by David A. Keeps. Los Angeles Times (February 2, 2010). Photo credit: Still from A Single Man by Eduard Grau/Weinstein Co.
” ‘I love these pieces. They have been really popular,’ said Zack Taylor, president of Wesley Hall. 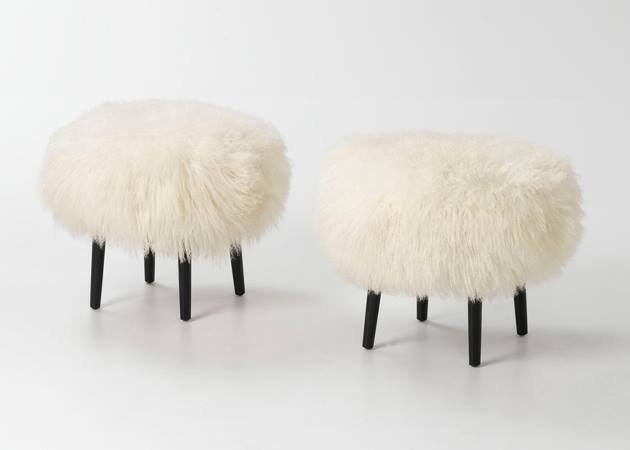 The company had three-legged stools topped with Mongolian lamb’s wool” at High Point Fall 2013. “Wool Coverings Showing Up On Stools, Chairs and Benches” by Patricia Sheridan. Houston Chronicle (February 12, 2014). 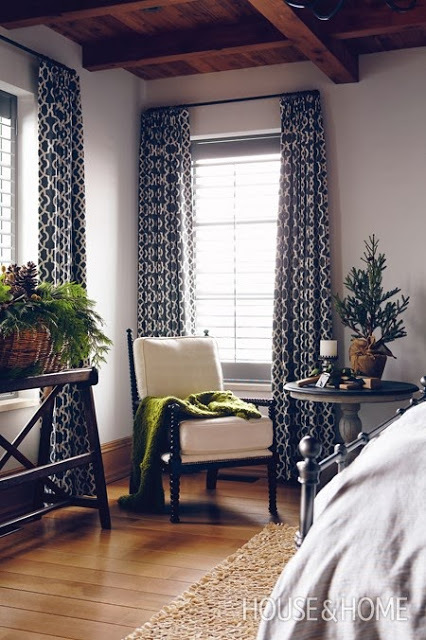 Janet Brown Interiors is your Richmond source for Wesley Hall. Museu d’Art Contemporani de Barcelona. 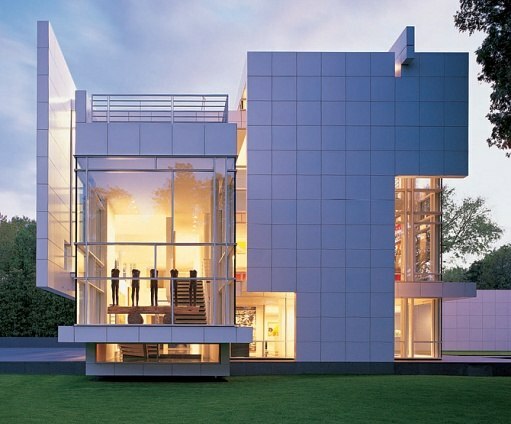 Designed by architect Richard Meier. 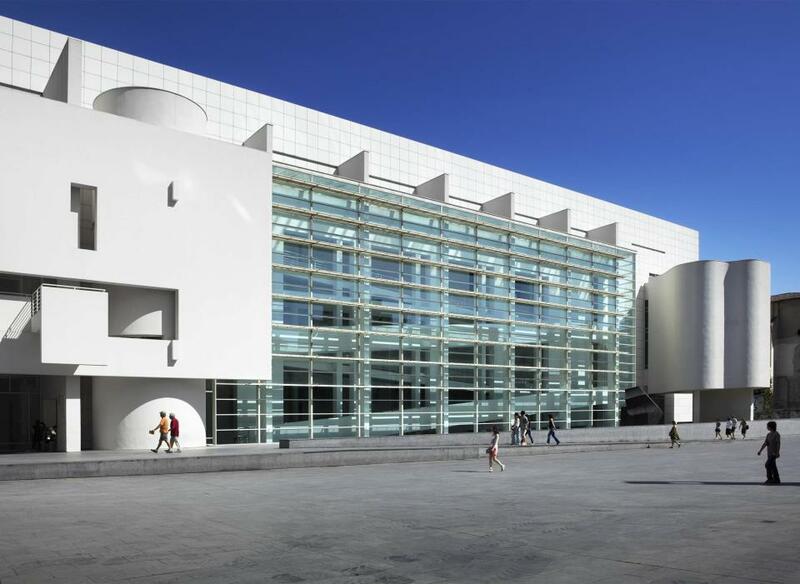 Photo via MACBA’s Facebook page. “For the Rachofsky House in Dallas, [architect Richard] Meier created a space for both an individual to live as well as an international private collection of artwork. Meier made ‘art a part of the experience’ in the house, with a focus on light and hard lines.” Photo: Scott Frances. “Richard Meier,” Architectural Digest (March 2002). Detail from “Asiatic Sarcophagus,” 3rd century A.D. Virginia Museum of Fine Arts – Richmond, Virginia. 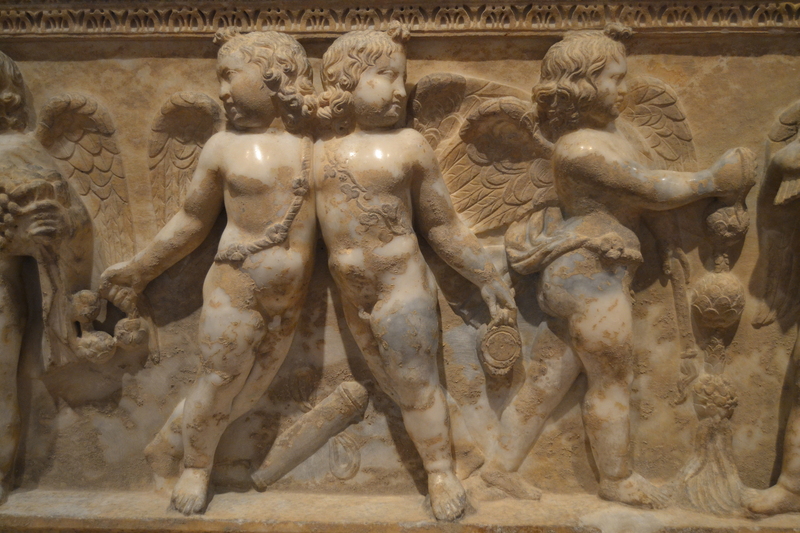 “The figures on this sarcophagus are all erotes, winged boys who take their name from the god Eros. . . . The significance in antiquity of the scenes on this sarcophagus may have varied from viewer to viewer. Some may have seen in Dionysiac celebration the promise of a blissful afterlife, while others may have been reminded of feasts held at tombs or imagery that adorned many homes and public spaces.” Text: VMFA. Photo by Kathleen Sams Flippen. Vietri serving pieces available through Janet Brown Interiors: Lastra Grey Salad Plate, Optical Clear Champagne Glass, Lastra White Dinner Plate, Grey Medallion Accent Napkin, Aladdin White Antique Five-Piece Place Setting. Photos by Ashley Batz for Sacramento Street. 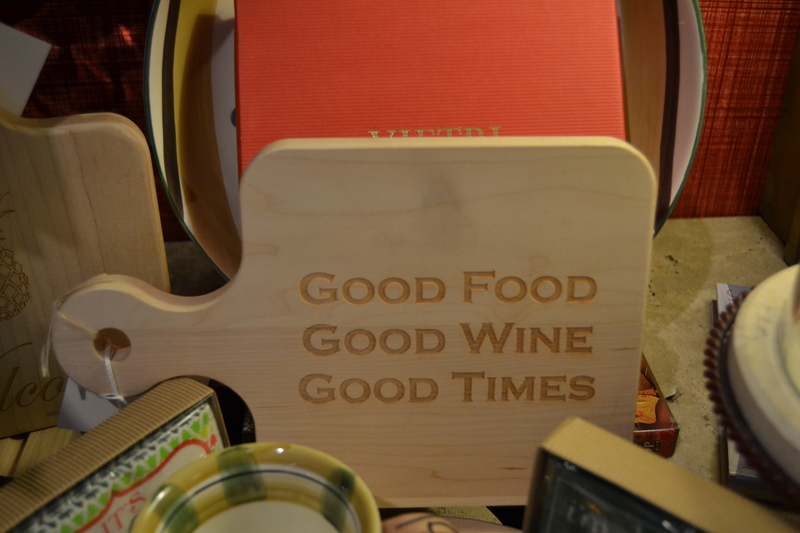 “Effortless Entertaining with Vietri,” Sacramento Street blog (October 23, 2014). 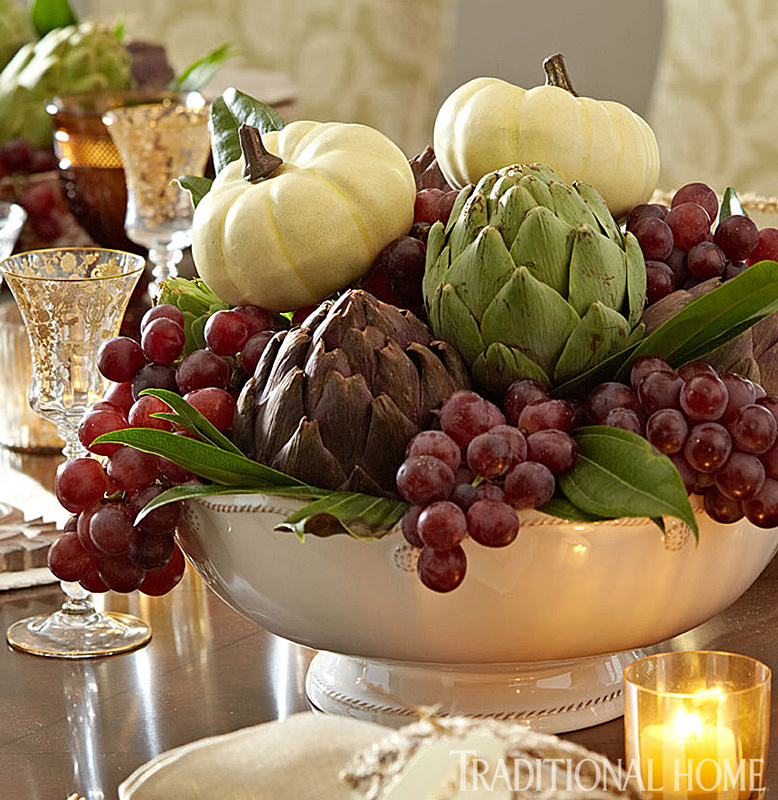 “The ‘Berry & Thread’ fruit bowl by Juliska [available through Janet Brown Interiors] displays a bountiful mix of artichokes, grapes, and white pumpkins.” Photo: Peter Krumhardt. “Great Gatherings: Two Holiday Dinners” written by Candace Ord Manroe. Traditional Home. 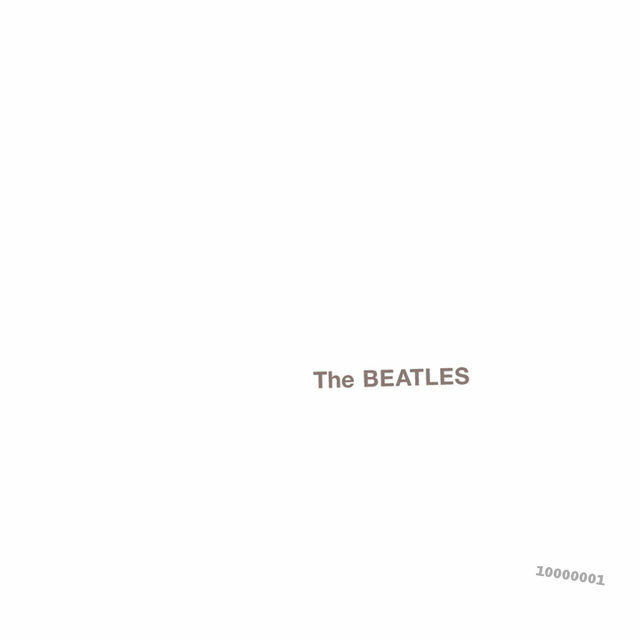 White Album released by the Beatles in 1968. “The original vinyl copies released in 1968 had the band’s name embossed on a white background. These pressings were also numbered.” Design by Richard Hamilton, a Pop and Conceptual artist. Photo via Wikipedia. 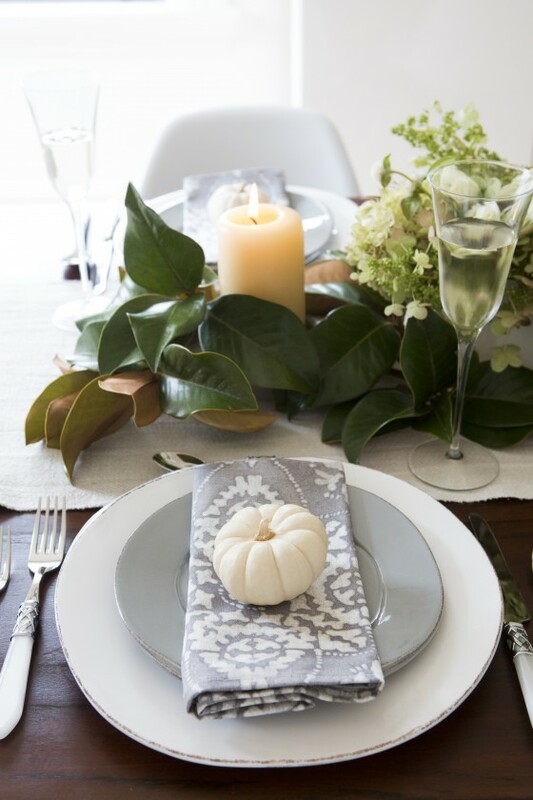 Happy Thanksgiving from Janet Brown Interiors! *Source: The New Munsell Student Color Set, 3rd ed. by James Thomas Long, School of Arts – Virginia Commonwealth University (Fairchild Books: New York). 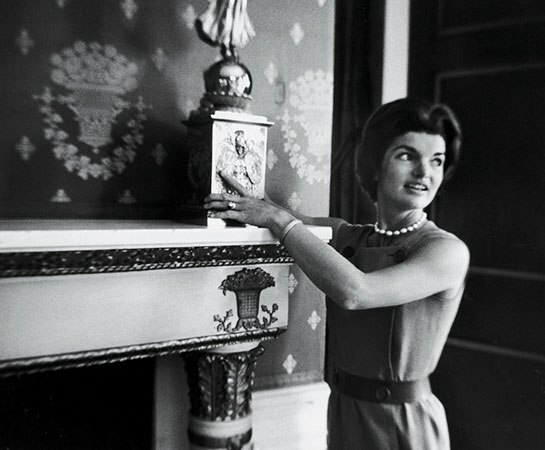 What do the set of Gone with the Wind, Mick Jagger’s 1966 home, and the Kennedy White House have in common? “Jacqueline Kennedy in 1961, in the White House’s Blue Room, then lined with a Schumacher silk lampas.” Photography by Ed Clark/The Life Picture Collection/Getty Images. Text by Mitchell Owens. 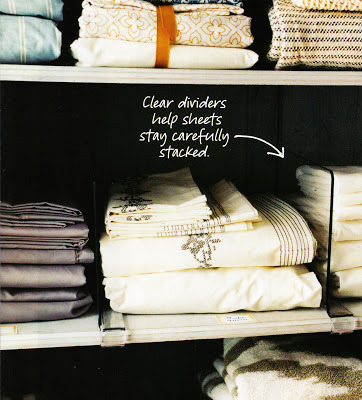 “American Textile Firm Schumacher Celebrates Its 125th Anniversary,” Daily AD – Architectural Digest. (September 10, 2014). 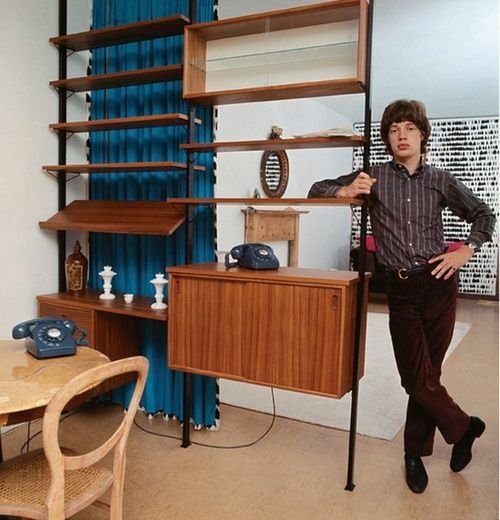 Mick Jagger at home during the mid-1960s. 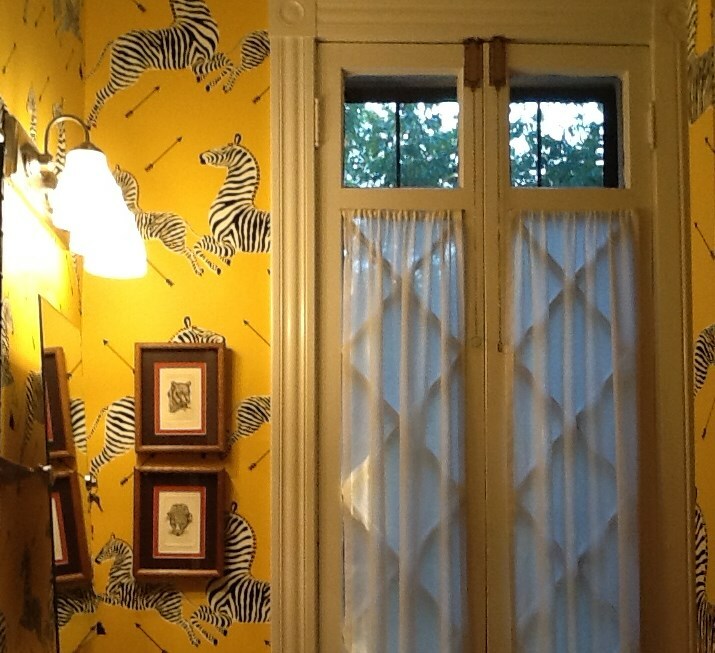 Walls and curtains in Queen of Spain, a perennial Schumacher favorite. Text via Schumacher. Photo via Pinterest. 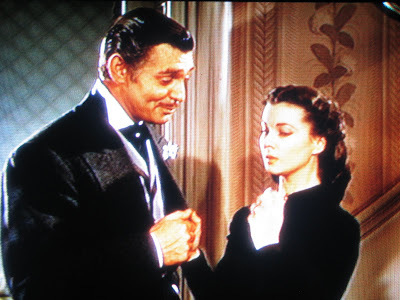 Scene from Gone with the Wind featuring Clark Gable as Rhett Butler and Vivien Leigh as Scarlett O’Hara. Schumacher’s “Hydrangea Drape” in Fawn is on the wall along the staircase. Photo via Pinterest. The Kennedy White House, Mick Jagger’s mid-1960s home, and the 1939 film Gone With the Wind all featured Schumacher wallcoverings. 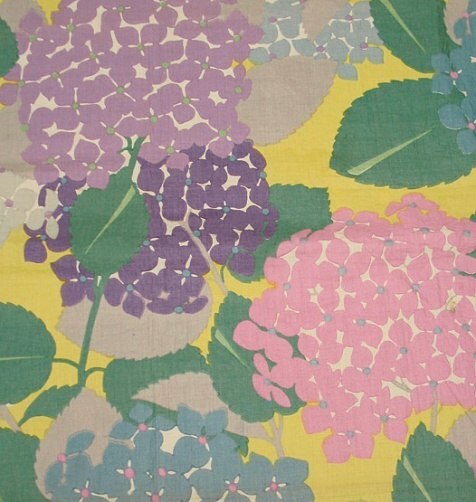 Here is “Hydrangea Drape,” as seen above in Gone With the Wind. The pattern is still in production. The textile firm F. Schumacher, which celebrates its 125th anniversary this year, has played a role in popular culture by appearing on movie sets and in rock stars’ homes. 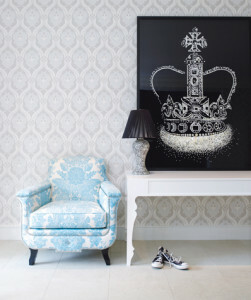 Throughout its history, the firm has worked with fashion designers and interior decorators to combine Old World techniques with modern styles. 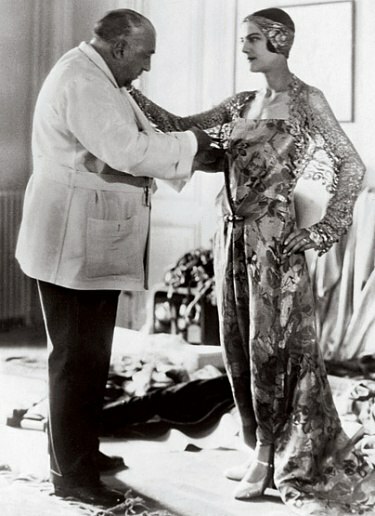 In the past, Schumacher partnered with couturiers Christian Dior, Paul Poiret, and Elsa Schiaparelli. 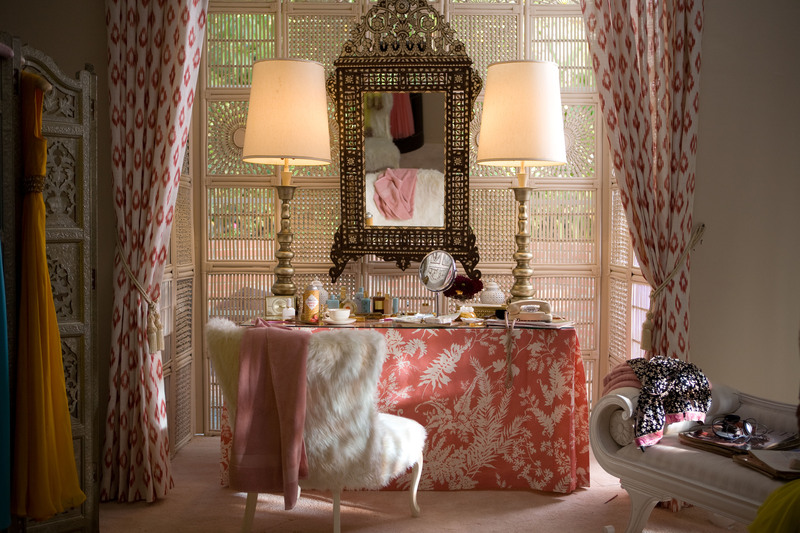 Today the firm offers the designs of decorators Alessandra Branca, Timothy Corrigan, and Martyn Laurence Bullard. Here are some images from Schumacher’s past and present . . .
“Paul Poiret fits a gown in around 1930. He was the first fashion designer F. Schumacher tapped to create a collection. Launched in 1930, it proved exceptionally popular among the firm’s clients. Photo: © Underwood & Underwood/Corbis.” Text by Jeffrey Simpson. “Fashionably Inspired,” Architectural Digest (May 2008). “The bright hues of Hortensias display Poiret’s unique understanding of color.” Photo courtesy of F. Schumacher and Co. Text by Jeffrey Simpson. “Fashionably Inspired,” Architectural Digest (May 2008). Here is a bit of fashion trivia. Do you remember the harem pants that Lady Sybil wore during the first season of Downton Abbey? “Lady Sybil’s audacious harem-pants costume. The bodice was constructed of fragile vintage fabric, which split during filming and had to be repaired (Courtesy, Winterthur. Photo by James Schneck.) 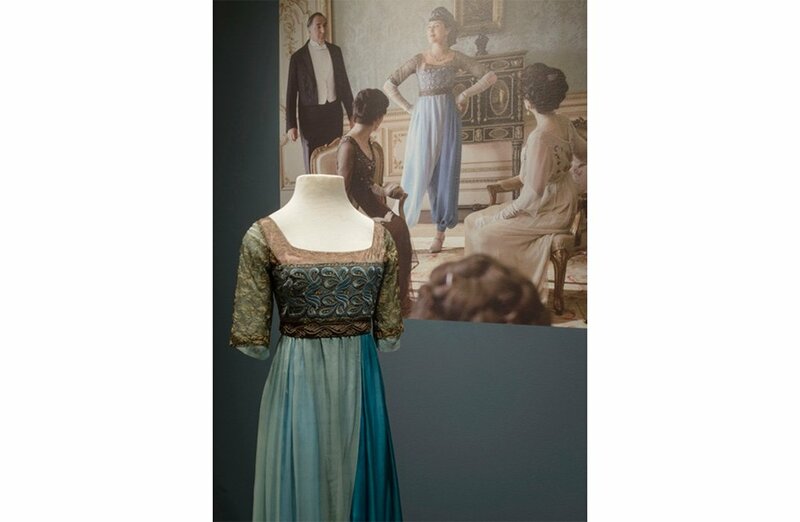 “The Costumes of ‘Downton Abbey’ Now on View at Delaware’s Winterthur Museum” by Constance Bond. Smithsonian.com (March 5, 2014). The exhibit “Costumes of Downton Abbey” will remain on display at Winterthur Museum until January 4, 2015. 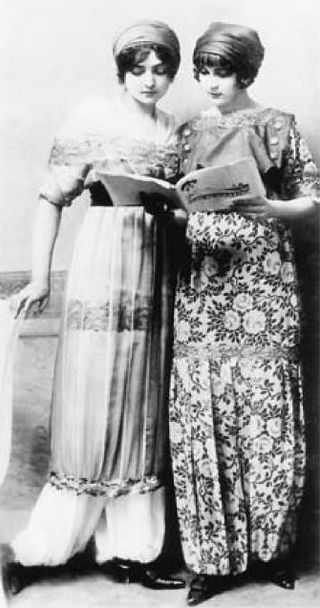 “Two women dressed in sultana skirts and harem pants designed by Paul Poiret in 1911. Published in L’Illustration, 1911.” Photo via Wikipedia. Schumacher also worked with Christian Dior, who presented his first fashion show in 1947. 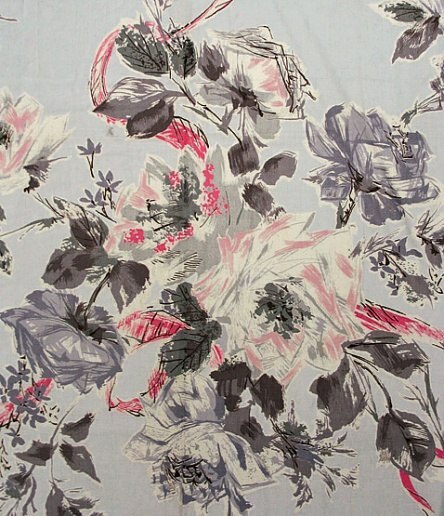 “Dior Toile was part of a 1997 line by Gramercy, then a division of F. Schumacher and Co., introduced to coincide with the 50th anniversary of Christian Dior’s first couture collection. It continued the firm’s tradition of looking to the fashion world for innovative designs—and designers—for its fabrics and wallcoverings. Photo courtesy of F. Schumacher & Co.” Text by Jeffrey Simpson. “Fashionably Inspired,” Architectural Digest (May 2008). 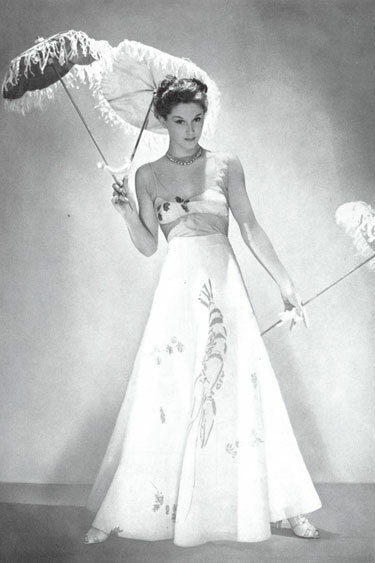 “In 1947, Christian Dior presented a collection of wasp-waisted and hip-padded designs. 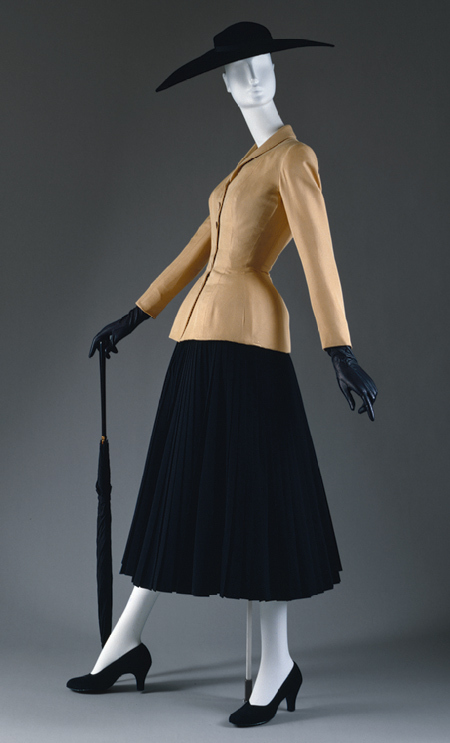 The American press immediately dubbed it the ‘New Look.’ The ‘Bar’ suit was considered the most iconic model in the collection, manifesting all the attributes of Dior’s dramatic atavism. 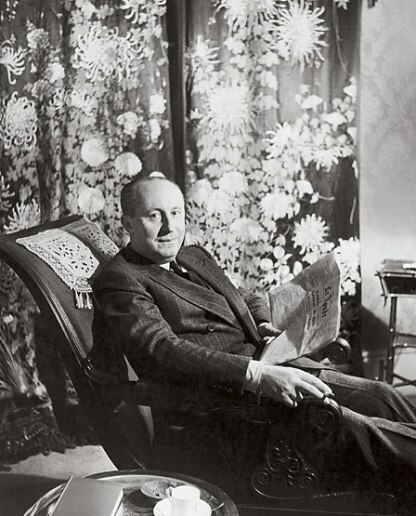 Although Dior created many notched collars, he was a fervent advocate of shawl collars and curved necklines. Arguably, the shawl collar plays effectively with the curvaceous forms Dior articulated at the shoulders and hips. The full pleated calf-length skirt, of black wool, is a replica of the original skirt of the suit. Marc Bohan ordered it made up in the Dior workroom to complete the suit for The Costume Institute Collections.” Photo via The Metropolitan Museum of Art website. “Dior in 1947. Photo: © Emile Savitry/Rapho/Eyedea.” Text by Jeffrey Simpson. “Fashionably Inspired,” Architectural Digest (May 2008). Elsa Schiaparelli was an Italian-born French couturier who partnered with Schumacher. Paul Poiret had been her mentor. According to Architectural Digest, Ms. Schiaparelli’s designs for the Waverly division of Schumacher were “largely sweet-natured”; she was known for more avant-garde collaborations with artists such as Salvador Dali. Salvador “Dali’s 1937 lobster dress, a collaboration between the artist and Elsa Schiaparelli.” Photo: George Platt Lynes, Harper’s Bazaar (April 1937). “The Bazaar World of Dali,” by Julie Belcove Harper’s Bazaar (December 19, 2012). 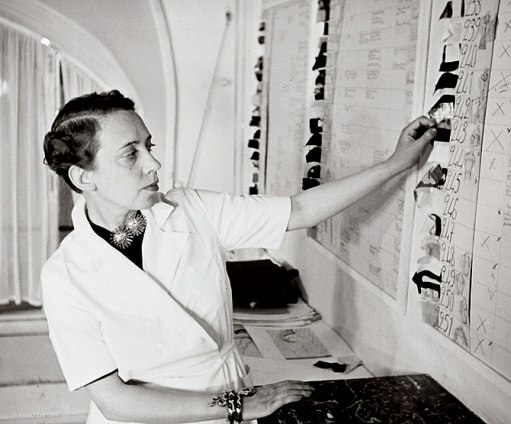 “Toward the end of her career, Elsa Schiaparelli (above, in 1938) turned her talents to a line of fabrics and wallcoverings for Waverly, at the time an F. Schumacher division. The designs captured a dynamic spirit similar to that of her clothing.” Photo: John Phillips/Time Life Pictures/Getty Images. Text by Jeffrey Simpson. “Fashionably Inspired,” Architectural Digest (May 2008). “Madelon appeared in 1958. It was accented with splashes of shocking pink, Schiaparelli’s signature color.” Photo courtesy of F. Schumacher and Co. Text by Jeffrey Simpson. “Fashionably Inspired,” Architectural Digest (May 2008). 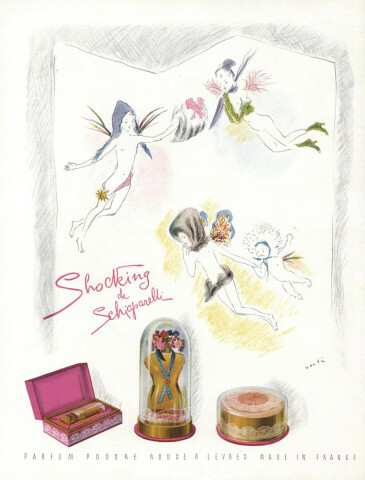 “Advertisement for Shocking De Schiaparelli, appeared in Vogue’s December 15, 1938 issue. Photo: Courtesy of Schiaparelli.” “Elsa Schiaparelli’s Enduring Influence on Beauty” by Lindsay Talbot. Vogue (May 4, 2012). 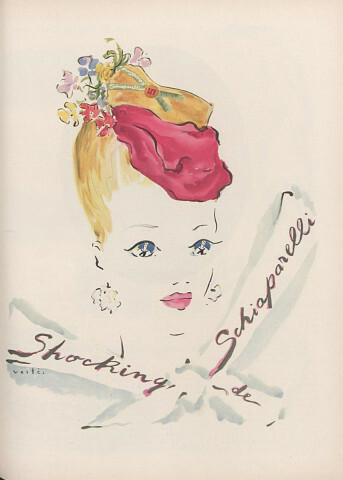 “Advertisement for Shocking De Schiaparelli, appeared in Vogue’s April 1, 1943 issue. Photo: Courtesy of Schiaparelli.” “Elsa Schiaparelli’s Enduring Influence on Beauty” by Lindsay Talbot. Vogue (May 4, 2012). 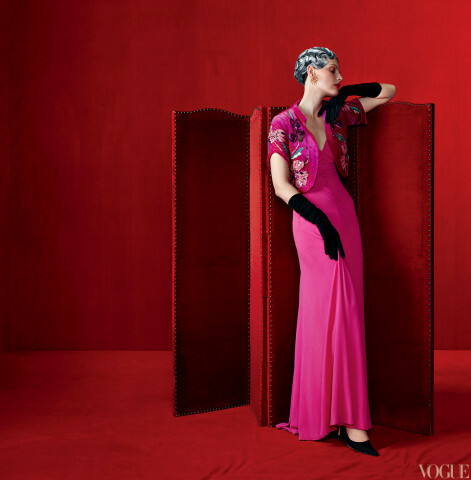 “Model Guinevere Van Seenus wears the designer’s [Elsa Schiaparelli] shocking-pink dress (fall 1937) and silk-velvet bolero with metal embroidery by Lesage (fall 1938) in the May issue of Vogue.” Photographed by Steven Meisel, Vogue, May 2012″ Elsa Schiaparelli’s Enduring Influence on Beauty” by Lindsay Talbot. Vogue (May 4, 2012). 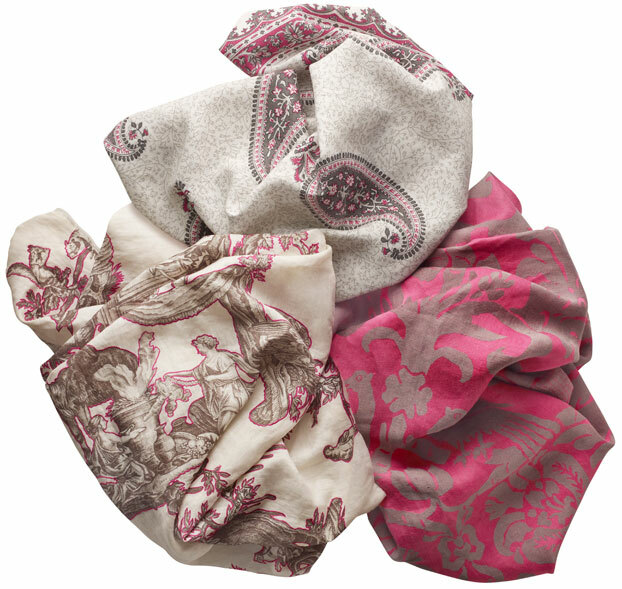 “In her new fabric collection, Alessandra Branca uses vivid fuchsia . . . to bring spirit and youth to lush, classical motifs. As the painstakingly embroidered accent on a toile and the sumptuous ground of an overscale damask, this vibrant palette is an upbeat alternative to muted neutrals. For sure, daring color is in the air: hot pink tones feel fresh in contemporary art and the latest fashion. But a closer look reveals that this buoyant hue has been a key part of the style lexicon for centuries. From the grandeur of Versailles to 1920’s London, fuchsia adds a pop of the unexpected and a jolt of confident chic. . . . dynamic color is and always will be in style.” “Eye-Catching: Bold Fuchsia Hues from the Alessandra Branca Collection,” The Schumacher Blog (September 5, 2013). “To appreciate them you have to touch them: paisleys swirling on heavy cotton; vibrant damasks woven from supple linen; gorgeous modernized toiles in which the pictorial motifs are outlined in painstakingly embroidered stitching. The ‘hand’ of designer Alessandra Branca’s new line of fabrics for Schumacher was just one of the elements she was dead set on getting right. She also researched royal tailoring techniques of the 18th century and experimented with artists’ pigments to assess ideal hues. That rigor has produced a fresh collection of 48 textiles with staying power. ‘They’re the kinds of fabrics your kids will want to use and your grandchildren will love to inherit,’ says Branca. 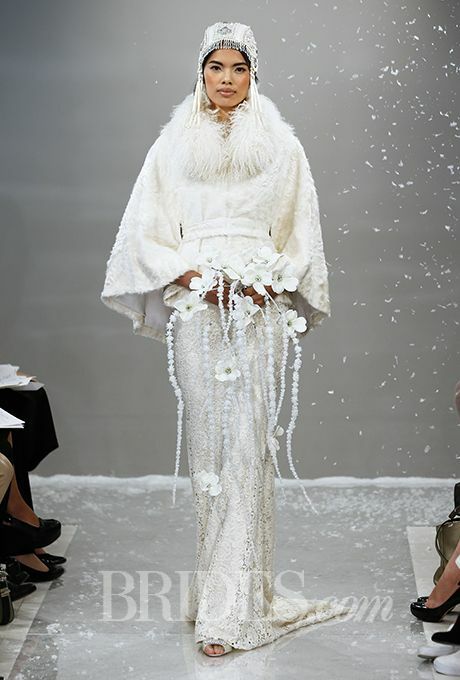 “Well-Designed: Alessandra Branca for Schumacher” by Mario Lopez-Cordero. Veranda. 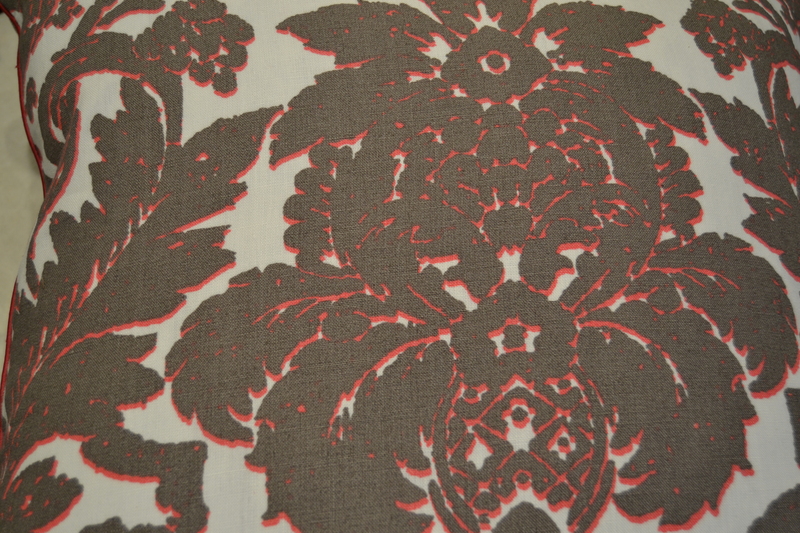 This pillow by Alessandra Branca for Schumacher currently is available at Janet Brown Interiors. 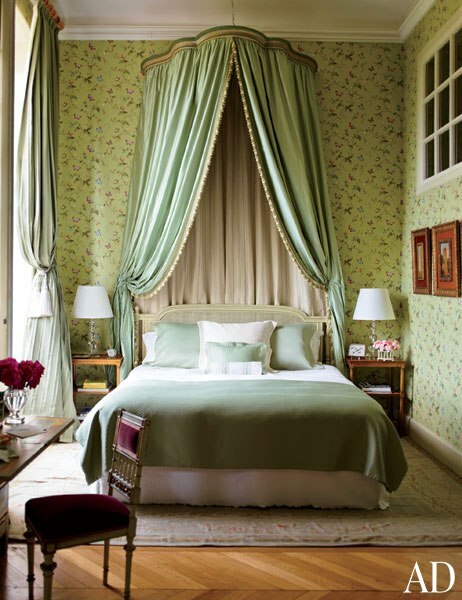 “Corrigan lined the walls of a guest room with a Waverly wallpaper; the green fabric on the canopy is by Schumacher, and the carpet is a 19th-century Aubusson. 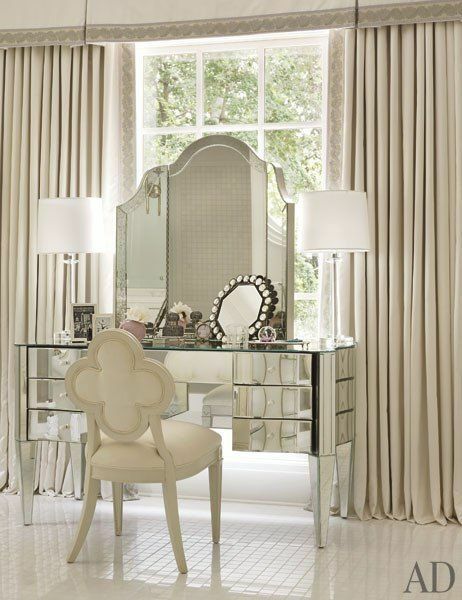 On the desk stands a Baccarat vase.” Chateau du Grand-Luce, the neoclassical Loire Valley chateau owned by Los Angeles-based interior decorator Timothy Corrigan. Photography by Eric Piasecki. Text by Fernanda Eberstadt. “Timothy Corrigan’s Spectacular French Chateau,” Architectural Digest (October 2013). 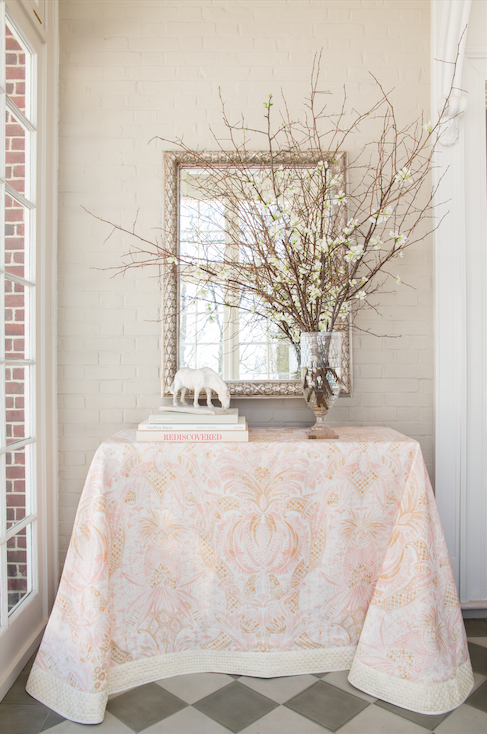 Table skirt in dusty pink and camel Cap Ferrat 175581 with ivory Directoire Tape 68643. 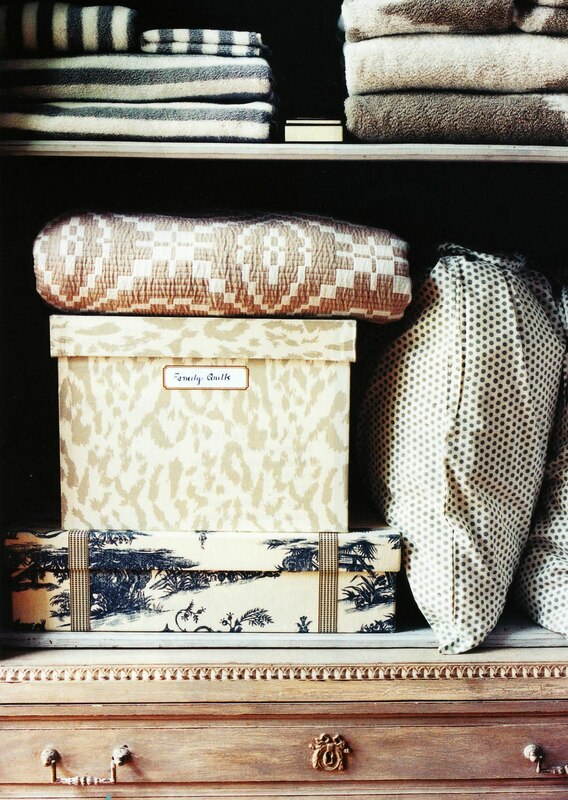 ” From interior decorator Timothy Corrigan’s collection for Schumacher. Tell Us Everything: Timothy Corrigan,” The Schumacher Blog (April 11, 2014). “In the foyer above, a Bolero chair by Mariette Himes Gomez for Hickory Chair is upholstered in Schumacher’s Lace in Aqua.” Gwyneth Paltrow’s home in the Hamptons. “At Home With Gwyneth Paltrow – Part One,” Habitually Chic (October 4, 2007). 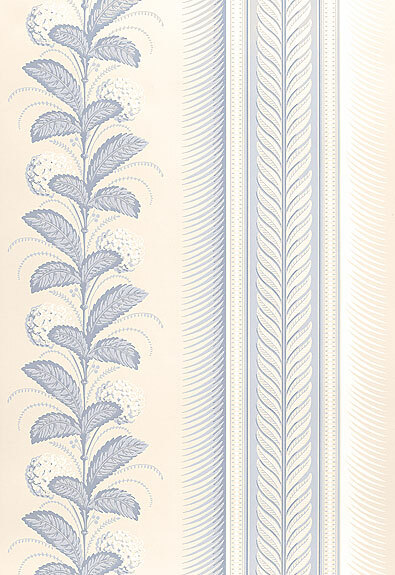 Schumacher fabrics and wallcoverings are available through Janet Brown Interiors. Come visit us to experience the collections in person. Southerners are known for their hospitality and their love of monograms. 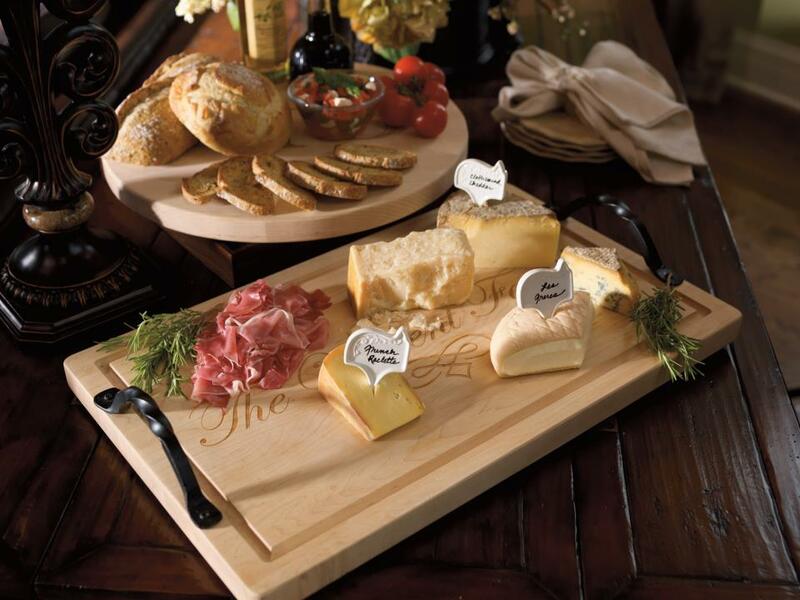 As you prepare to entertain and give gifts this holiday season, why don’t you visit Janet Brown Interiors and explore our selection of items for the home that can be personalized? 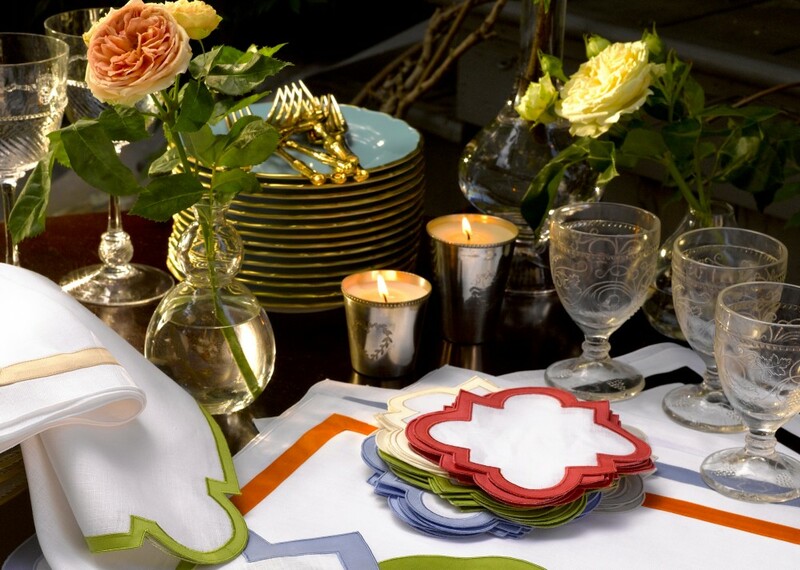 Set the table with monogrammed napkins and placemats from Matouk. House guests coming to stay? 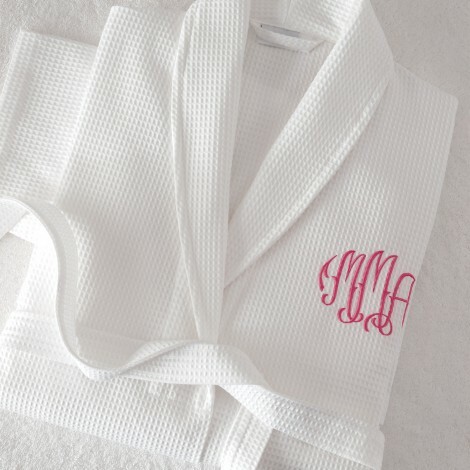 Freshen your linen closet with new monogrammed towels and sheets. Looking for practical, one-of-a-kind gifts? 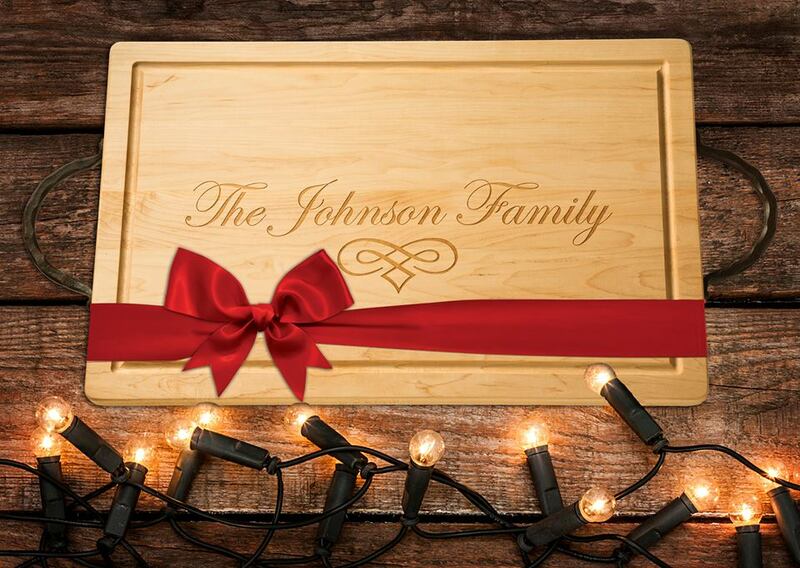 Order our picture frames and cutting boards with initials, witty sayings or the name of a vacation home. 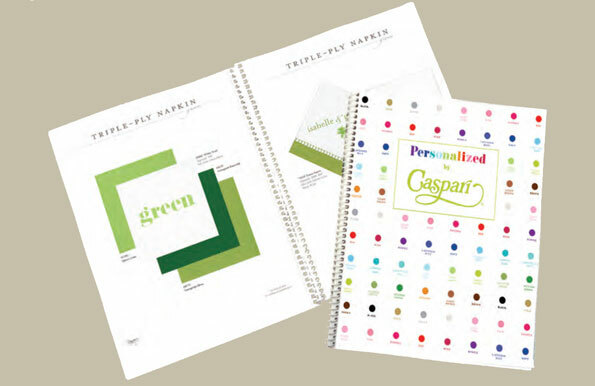 Personalized paper cocktail napkins and guest towels from Caspari are perfect to keep or give. Order your items now and beat the rush . 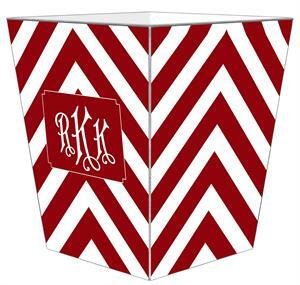 . .
“Place a monogram in the left corner of a napkin for optimum visibility. 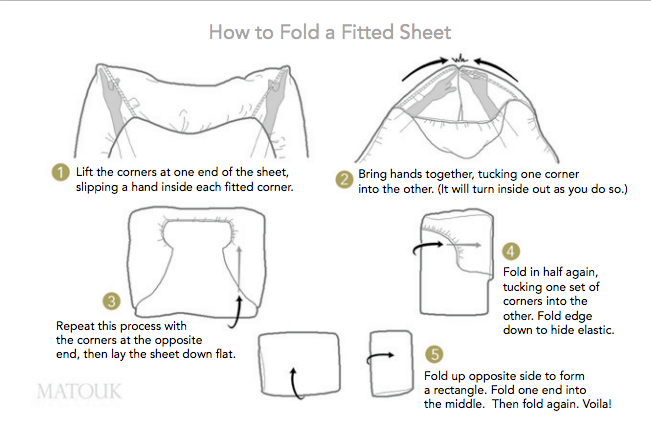 When folded in a triangle, it will appear at the napkin’s point, or, when folded as a rectangle, on the lower outside corner.” Photo: Hector Sanchez. 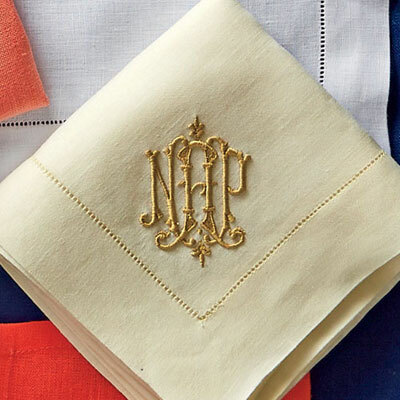 “A Guide to Monogrammed Napkins” by Jane Scott Hodges. Southern Living. “Ivory-with-gold is the classic ‘little black dress’ of the tabletop. It works whether china is white, bone, or something unexpected.” Photo: Hector Sanchez. 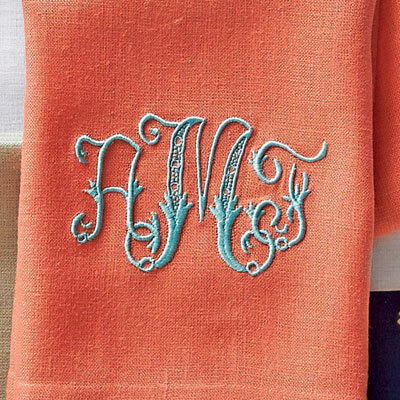 “A Guide to Monogrammed Napkins” by Jane Scott Hodges. Southern Living. 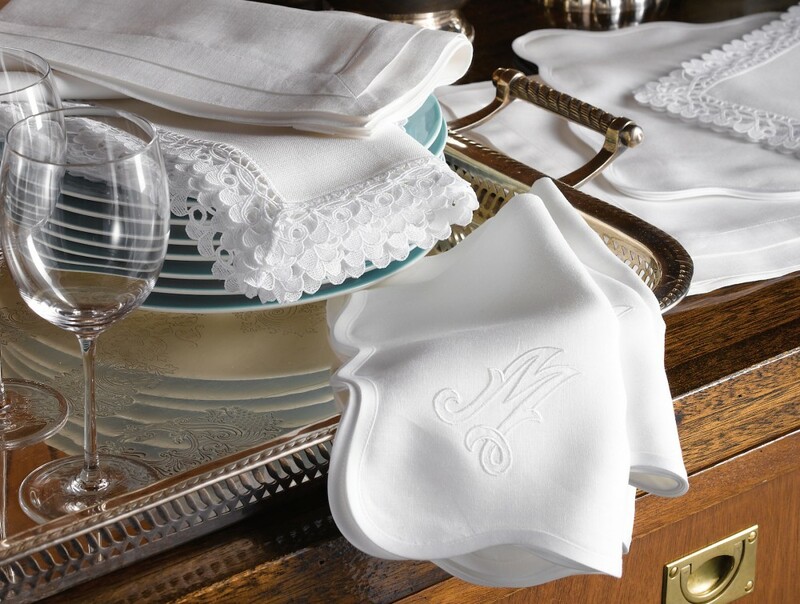 “Inspired by a stroll down Worth Avenue in Palm Beach, the unique arch trim of shop awnings becomes a tasteful complement to exquisite table linen.” Mirasol napkins, cocktail napkins and placemats from Matouk, Available through Janet Brown Interiors. 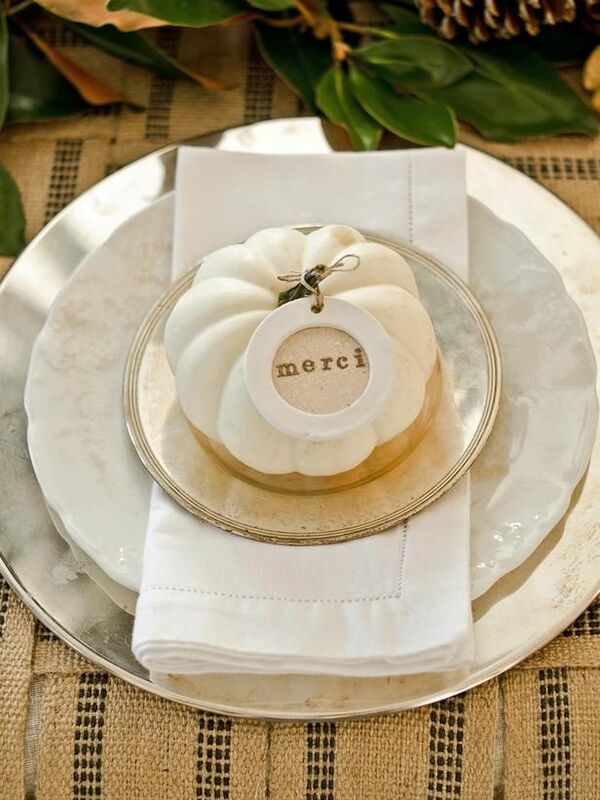 “When monogramming your place mats, keep the insignia in a conspicuous place, such as the top, to keep it from getting covered.” Photo: Hector Sanchez. 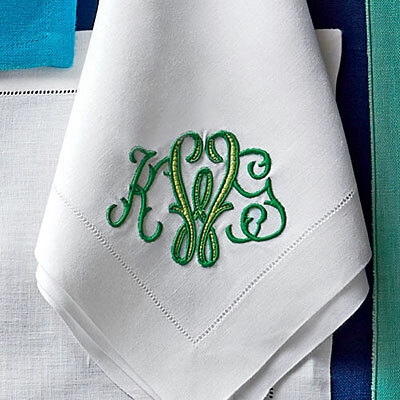 “A Guide to Monogrammed Napkins” by Jane Scott Hodges. Southern Living. 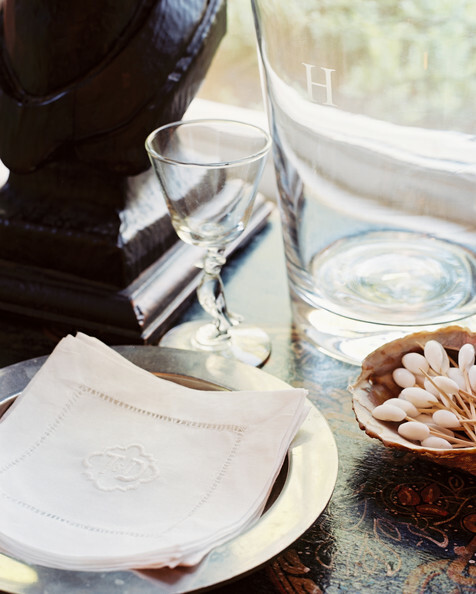 “Monogrammed cocktail napkins on a silver dish beside a grouping of bar supplies.” Source: “A Guide to Monogramming,” Lonny. 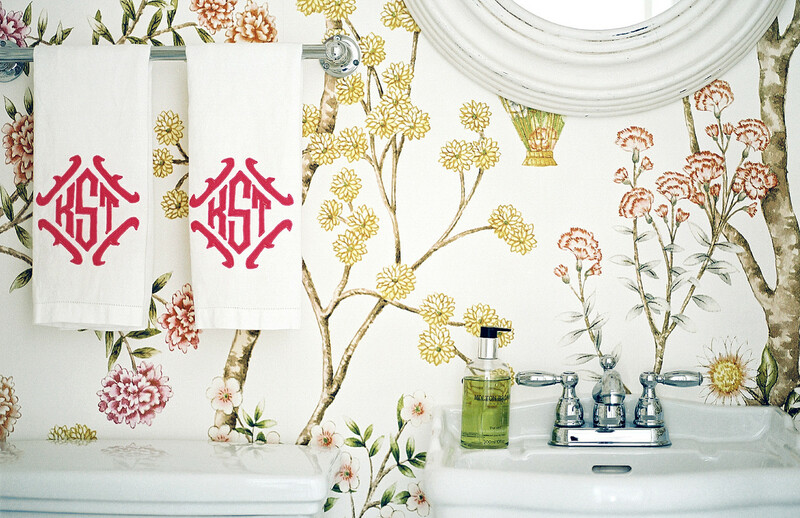 “Since these custom hand towels are meant to stand the test of time, don’t be afraid to match them to more permanent design elements. . . . the fuschia is plucked from the botanical wallpaper.” Rowayton, Connecticut, home of Kate Simpson, a former editor at Domino, and her family. Interior decorating by Kate Simpson. Photo: Patrick Cline. Styled by Michelle Adams. “Beach House” written by Shawn Gauthier. Lonny (October – November 2009). “This tiny West Village bathroom was designed to feel like an old school men’s club. Pairing the leather dopp kit with a black-and-white monogrammed hand towel” adds a handsome touch. 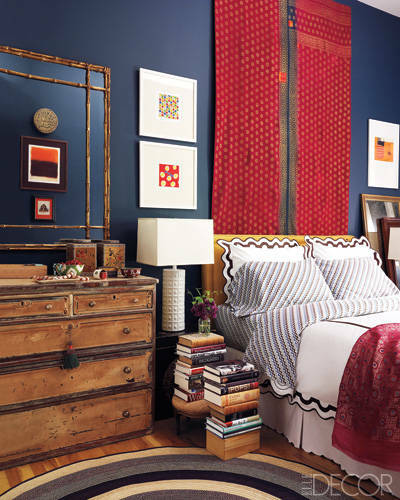 Interior design by apartment owners Ethan Feirstein and Ari Hickman. Photo: Patrick Cline. Styled by Michelle Adams. “An Evolved Collection” written by Shawn Gauthier. Lonny (October – November 2009). 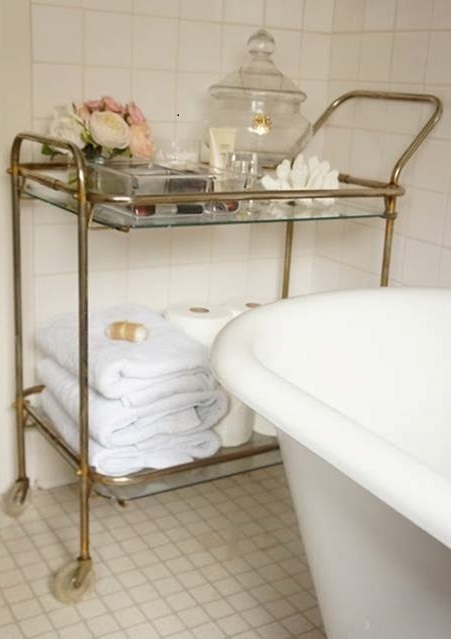 “Take hand towels out of the powder room, and use them as oversize napkins.” Photo: Hector Sanchez. 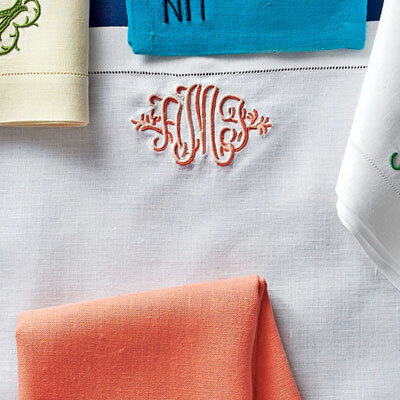 “A Guide to Monogrammed Napkins” by Jane Scott Hodges. Southern Living. Here is a photo of a bathroom that Janet Brown Interiors decorated recently. 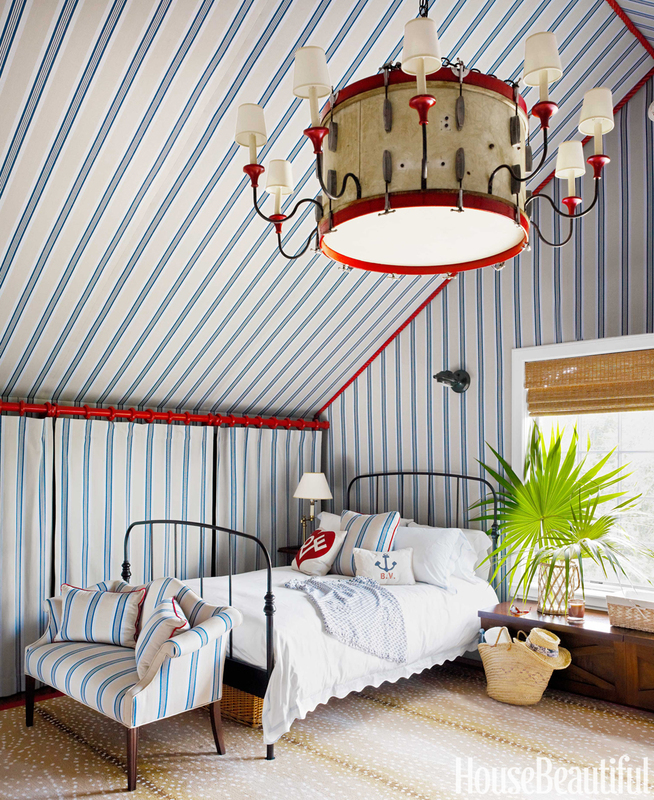 Don’t you love the zebra wallpaper by Scalamandre? Caspari offers a way to add a bit of “le zebre” to your powder room, too – with guest towels and napkins featuring the famous prancing zebra. 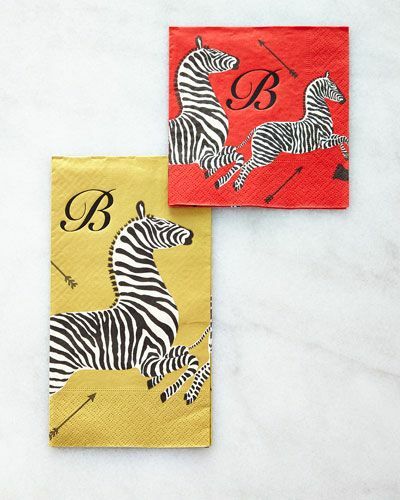 Personalized napkins and guest towels from Caspari featuring the famous Scalamandre zebras. 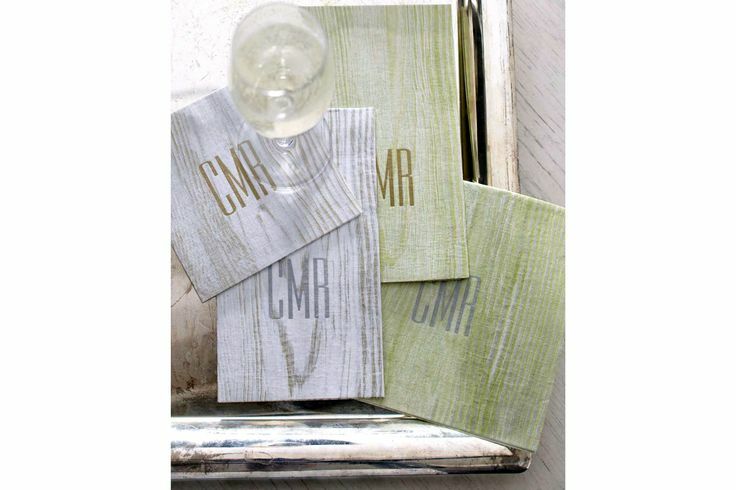 “Having seen these, don’t plain monogrammed cocktail napkins and guest towels seem incredibly boring?” Ellie Cullman of the New York design firm Cullman and Kravis asked the New York Times. (“Don’t Knock These Faux-Bois Accessories” by Rima Suqi, The New York Times, December 31, 2013). Photo of Jennifer Garner via Caspari website. 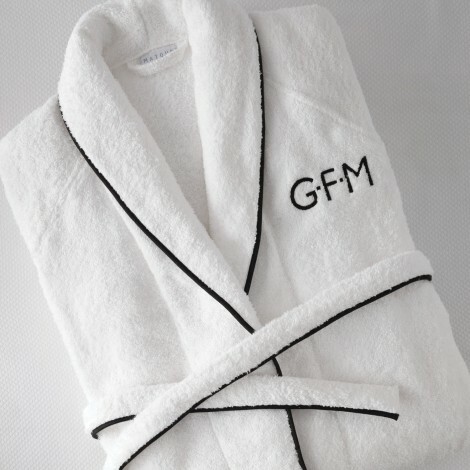 This waffle weave Egyptian cotton robe by Matouk is available in white. 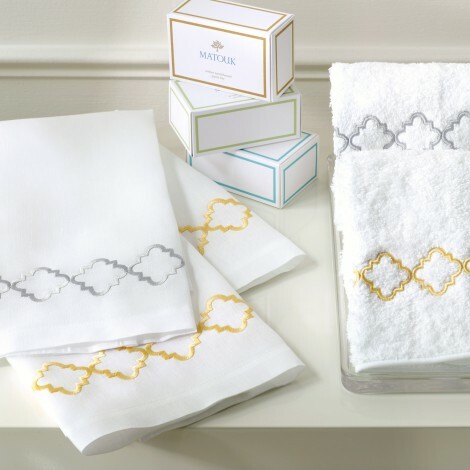 Matouk guest towels in silver and gold. We invite you to visit Janet Brown Interiors as you shop for the holidays. Let us help you check things off your list! 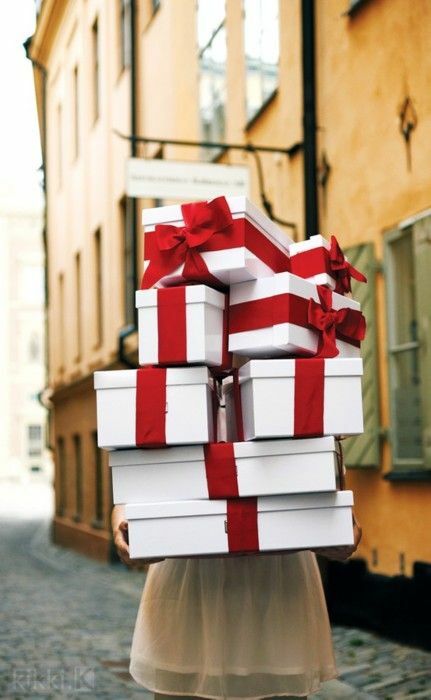 Photo via Pinterest: Veranda Magazine’s Well-Wrapped board.